November 2018 – After we left the RV/MH Hall of Fame in Elkhart, Indiana, it was late fall and high time to head to the southwest to warm up and dry off. Buddy has written about our stay in New Mexico, but there were some highlights before that I’d like to fill in. A beautiful sunset filled the sky as we headed west and south. The first was along I-70 between Indianapolis and St. Louis. 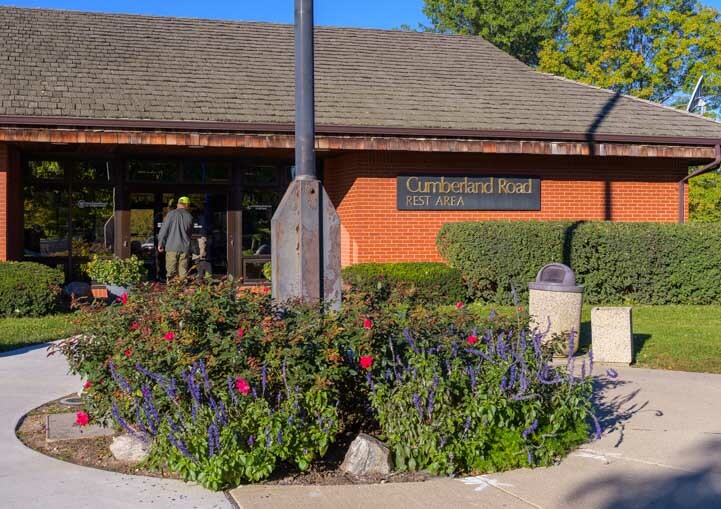 Most interstate rest areas are nothing to write home about, but we’ve found a few in our travels that are unique, and such was the case at the Cumberland Road Rest Area in Marshall, Illinois. As we walked towards the building we noticed a small group of people staring at something on the ground right by the entrance door — with smiles on their faces. When we got closer we realized they were all looking at a beautiful black cat. 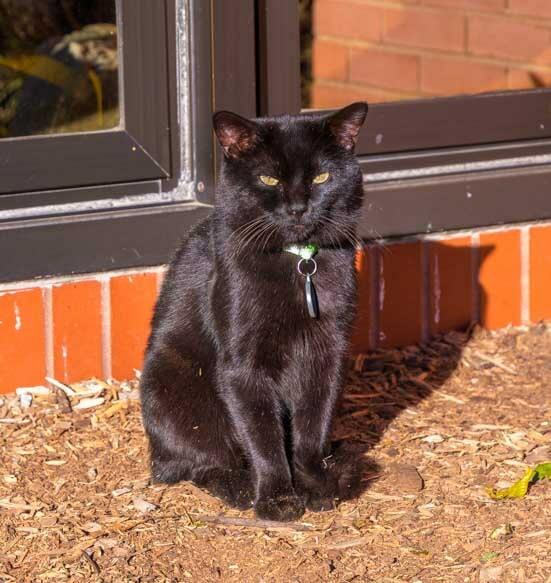 A small crowd by the entrance was admiring this beautiful black cat. The cat was just sitting there by the door, blinking slowly in the bright morning sunlight. People were wondering aloud if he was a lost pet or a runaway or if he was waiting for his owner to finish up in the bathroom. He seemed very calm and quietly sat there blinking in the bright morning sun. Then a fellow joined the group and explained that as a trucker who had come to the rest area many times before, he knew this beautiful feline. His name was Ghost, the Rest Area Cat. Just like the trucker, the cat had a regular route, going from one farm house to the next in the area. 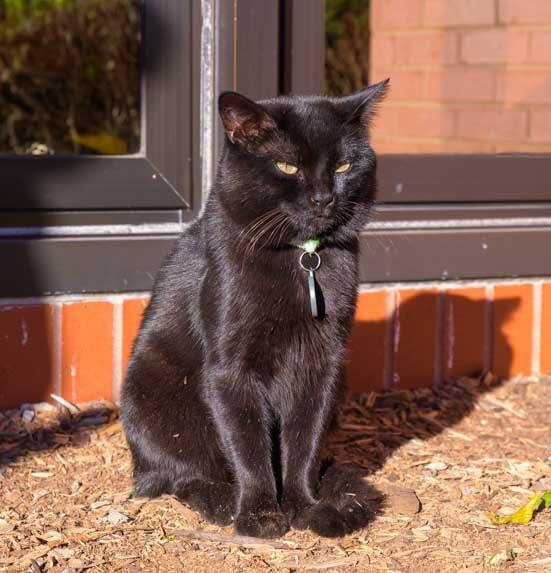 But he seemed to like the digs (and mice) at the rest area best, so he hung around the rest area a lot and made friends with the regulars and the transients. 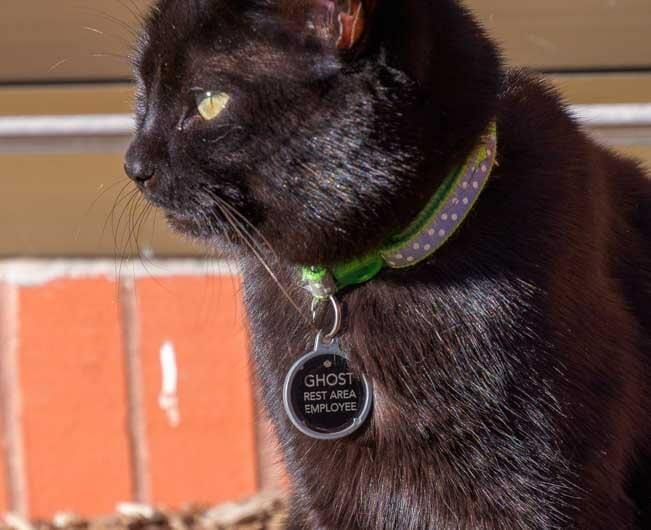 His human friends kept a good eye on him, though, and gave him a collar and a very cool nametag. If your travels ever take you on I-70 westbound, stop at the rest area that’s about 10 miles west of Terre Haute and say hello to Ghost! We got back on the interstate and the scenery buzzed by our windows in a blur. We all got white line fever and the places we drove by all began to blend together. But a brief stop at Fort Gibson Lake in Oklahoma stood out. This is a popular boating and fishing spot for local sailors and anglers and it’s a lovely spot for photography. In the midst of enjoying the views, we suddenly heard the whoosh of madly flapping wings and rapidly slapping webbed feet on the water. We looked up to see a huge flock of cormorants flying in from around the point and landing in the bay in front of us. Wave upon wave of cormorants kept flying around the point and splash landing in the water. We’ve never seen so many cormorants in a single flock. For at least five minutes the birds kept coming, until the whole bay in front of us was completely filled with birds bobbing in the water. And then after another vigorous round of splashing and flapping, they flew off and the water became calm again! Throngs of cormorants flew into the bay. This is just a few of them! We got off the interstate and traveled on a slew of secondary roads that took us through lots of small towns. As we approached Albany, Texas, we decided to have a look around. What a neat little find this town turned out to be! We’d crossed a few states since leaving Indiana, but we knew we were in Texas when we saw the big Texas star on the side of a building. The building turned out to be the Whitney Theater, home of the Dance Theater Company. Albany is a small town in size but it is big into the arts! Whitney Theater, home of the Dance Theater Company. The old jail house in Albany is now a modern art museum with a renowned collection. Outside the Old Jail Art Center there were lots of interesting sculptures. One was “Tex the Roustabout.” He got Buddy’s attention! The Old Jail House Art Center has a well renowned collection of modern art. Tex the Roustabout stood outside, pipe wrench in hand. Albany is is the county seat for Shackleford County and has a pretty courthouse. 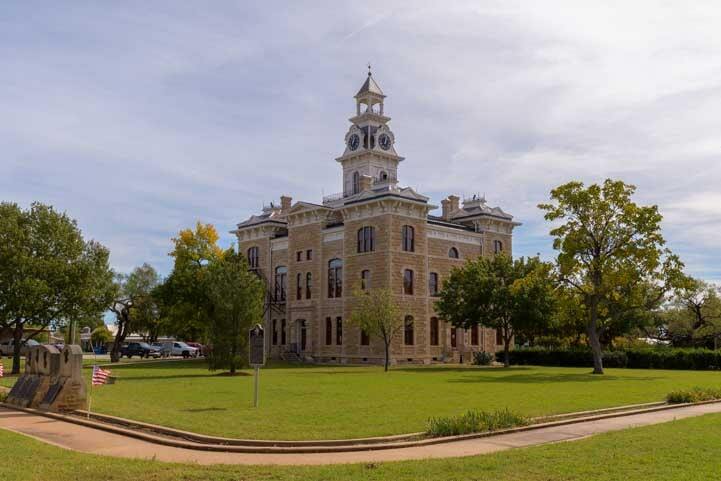 The county courthouse for Shackleford County is in Albany, Texas. 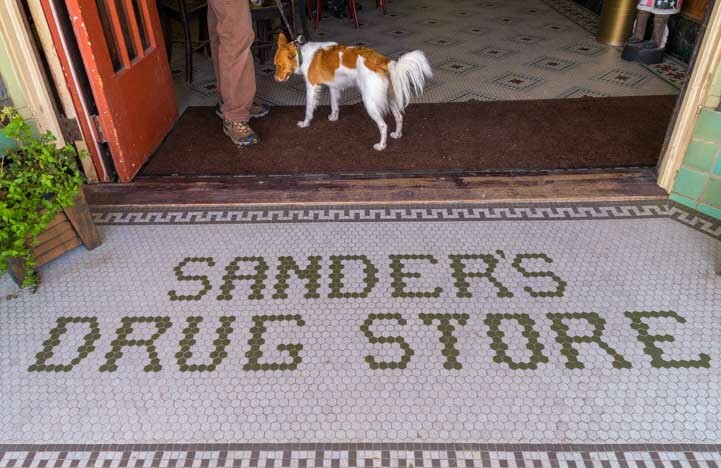 Our favorite spot in Albany was Sander’s Drug Store. As we walked across the antique mosaic sign on the ground, we felt like we were walking into another era. 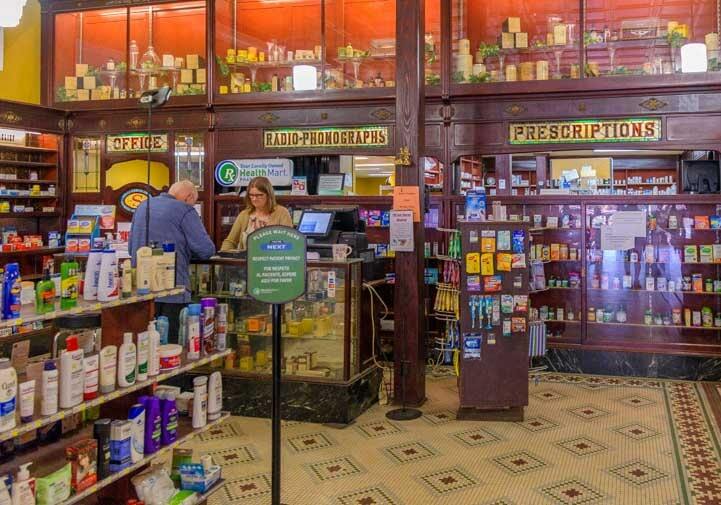 Sander’s Drug Store was the highlight of our visit and gave us a glimpse of another time. Inside there were people enjoying refreshments at tables and the antique looking pharmacy was out back. Not just “Prescriptions” but “Radio Phonographs” too! 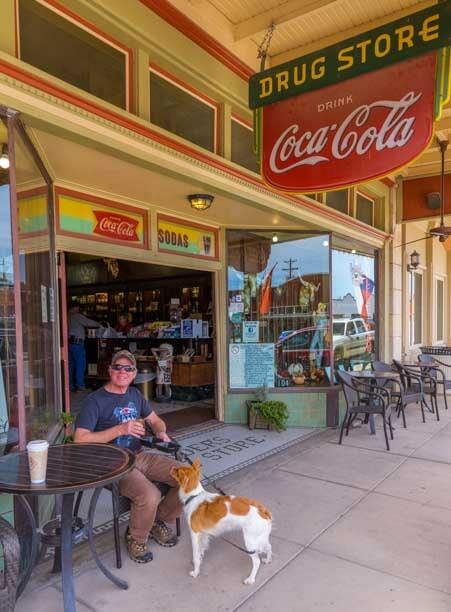 We got a latte and took a seat outside the store to watch the world go by on Main Street. 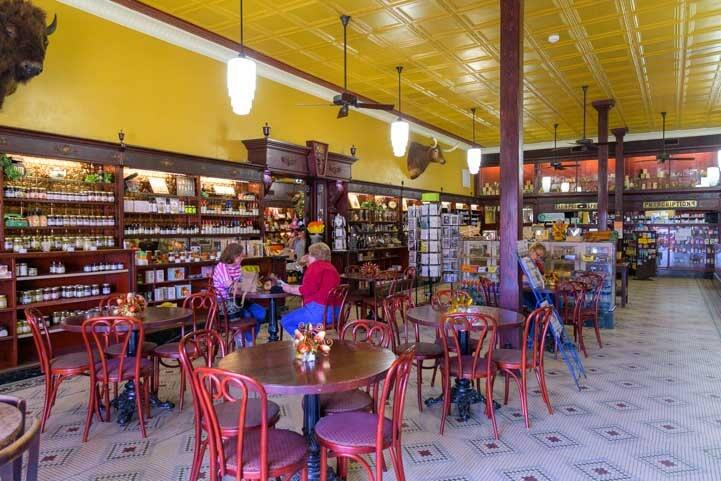 The couple at the next table started chatting with us and telling us how much they love this little town and that it’s their favorite weekend getaway spot from their home in Abilene 35 miles away. A nice spot out front to while away the hours. Albany may be a cute and artsy town today, but its roots are in cattle and oil. 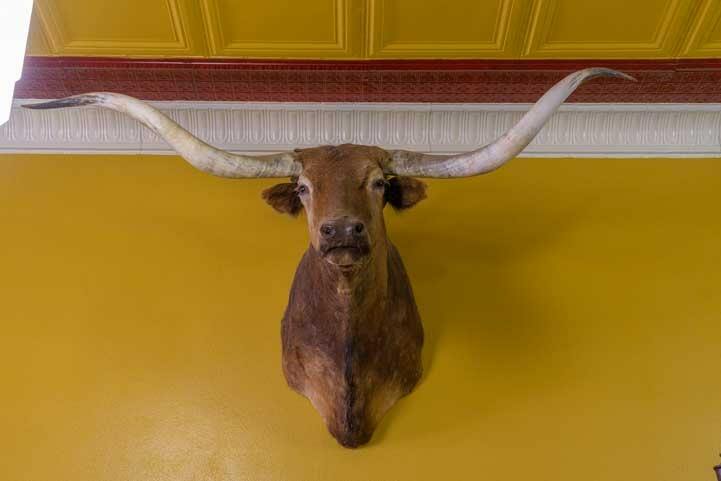 High up on a wall inside Sander’s Drug Store a Texas Longhorn looked down at us. 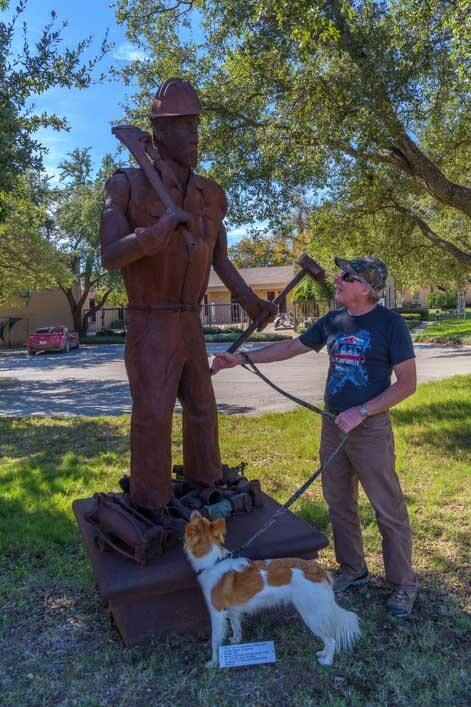 When we began wandering the streets of town again we found a metal sculpture of a Texas longhorn too as well as a plaque memorializing the Texas Cattle Trails of 1875 to 1890. Cattle herds from Texas were driven up to the railheads in Kansas along these routes. 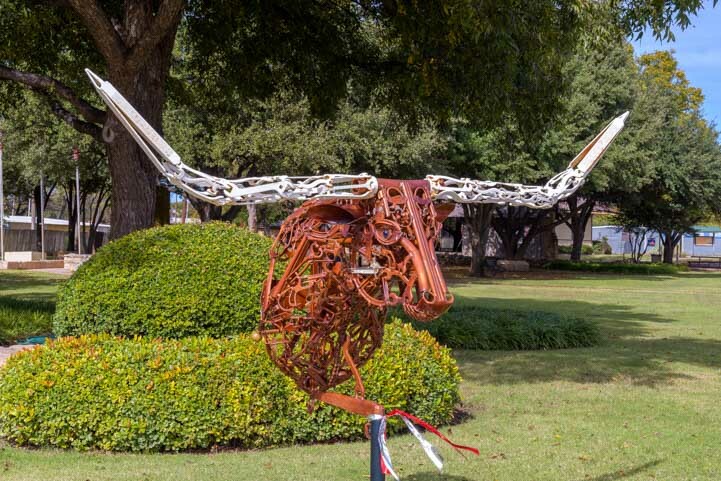 The arts in Albany pay homage to the Texas Cattle Trail history of the area. Petroleum production was the other big industry in the area and still is. 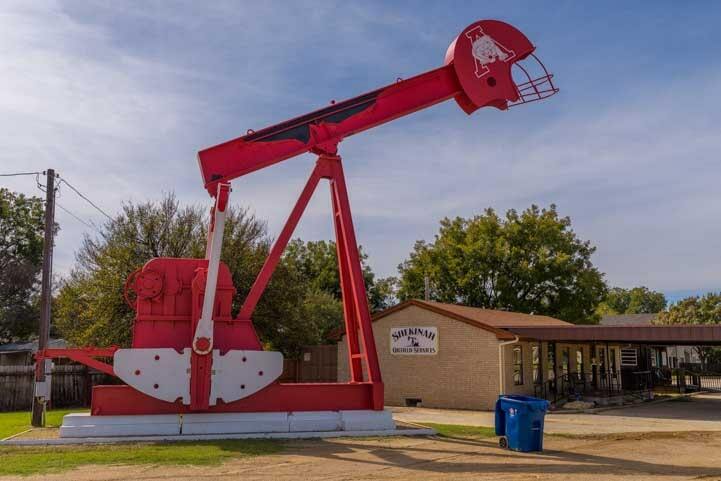 A replica oil pump outside an oilfield services office sported the high school Albany Lions football team helmet. An oil services company has a huge oil pumper out front with a football helmet on top! As we walked around town we came to a stand of trees that had dropped the most enormous acorns we had ever seen. These things were huuuuge! 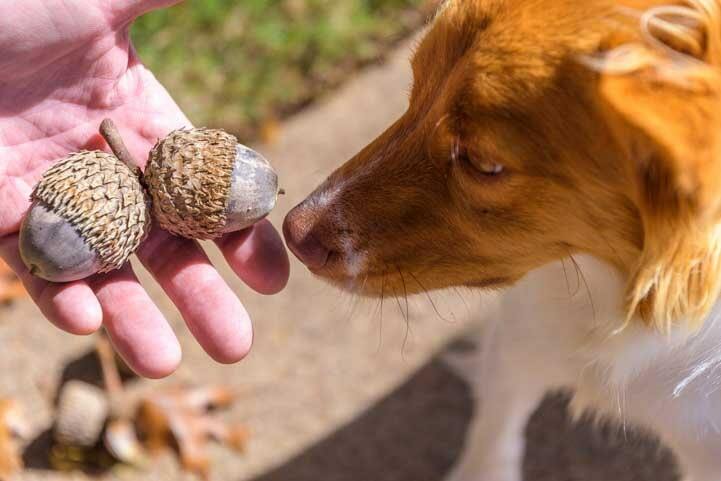 Well, as they say, everything is bigger in Texas, even the acorns! Even though we blasted across a few states to get back to the warm and dry southwest quickly, these few stops along the way made for some great memories. We scooted along pretty quickly for a thousand miles, but we’ll remember these special places and moments! Rainbow’s End – Escapees RV Club Headquarters! 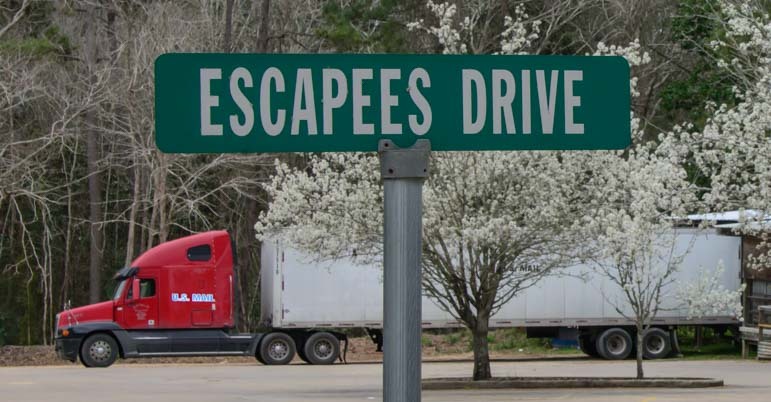 March, 2015 – We have been members of Escapees RV Club since our first year of RVing full-time, and we have always wanted to visit the Escapees headquarters in Livingston, Texas, just north of Houston. After visiting the stunning Caverns of Sonora in south-central Texas and getting a disc brake conversion done on our trailer in Forth Worth, we scooted east, stopping at the Casita Travel Trailer factory for a quickie tour, before spending five days at the Rainbow’s End RV Park on the huge Escapees campus. 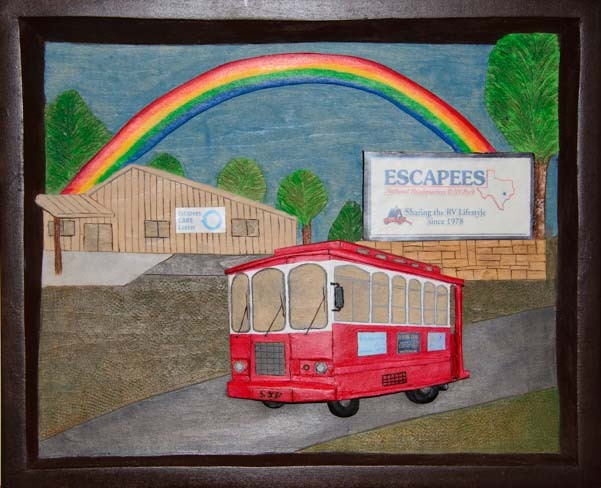 Escapees RV Club is an amazing organization that is as varied as any club could possibly be. Drawing together RVers of all shapes and sizes and ages and interests, Escapees provides a huge range of services for all of us, from bootcamp training sessions for new RVers to specialized RV weighing stations to overnight RV accommodations of just about every variety (ownership, long and short term RV site rentals, cheap dry camping, park model rentals, etc. ), assisted RV living for the elderly, mail forwarding services, an RV magazine, and on and on. When we arrived at the Livingston, Texas, headquarters, the annual Escapees rally called Escapade was taking place in Tucson, Arizona. 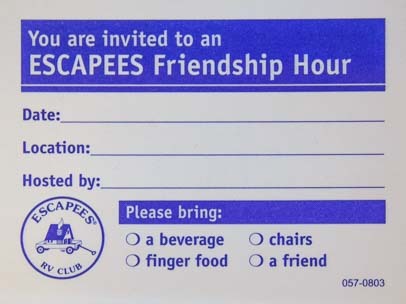 At that event, an exciting new facet of Escapees was introduced — Xscapers — a new branch of the club that is dedicated to younger RVers. This is an exciting development in a very dynamic club that has always sought to find new and creative ways to support the RV lifestyle. 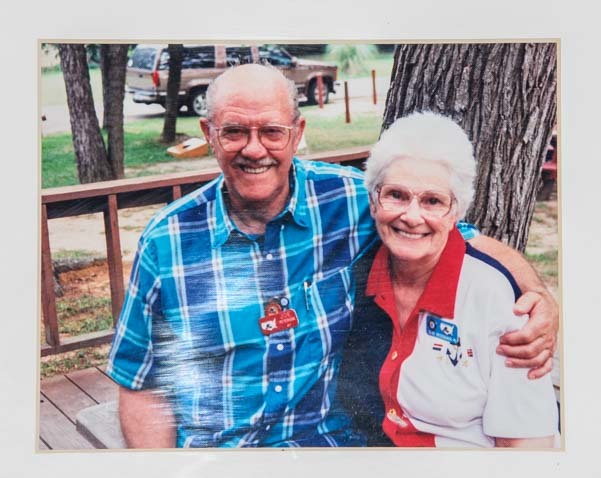 Escapees was founded by Kay and Joe Peterson, a couple that was among the pioneers of the full-time RV lifestyle many decades ago. They were avid “boondockers,” and they overnighted in their RV without hookups to electricity or water on a regular basis. With boondocking in its roots, most Escapees RV parks offer dry camping sites, usually for $5 per night (a little more for non-members). 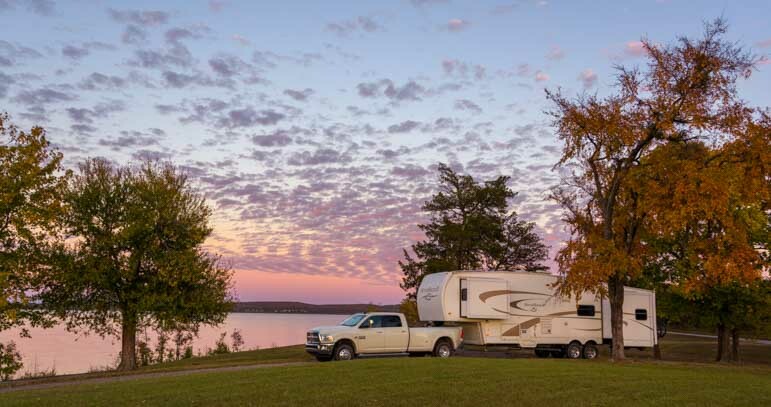 We were delighted to find that the Escapees Rainbow’s End RV Park in Livingston has three wonderful dry camping sites to choose from. After we walked to each site to check it out (none were in use — and we were told they rarely are! ), we settled on a nice, big site called “Dry Camp A.” Unlike the smaller full hookup sites, this site was big and had a great feeling of privacy with lots of trees bounding two sides. Dry Camp A — a super deal at $5/night! If nothing else, at least all that rain gave us great opportunity to use soft rainwater to wash our buggy and clean off the road grime from the nasty ice storm we’d driven through! The Escapees compound in Livingston is enormous. Not only is there the expansive Rainbow’s End RV Park, but there are park model homes and stick-built homes on sites scattered all around the outskirts of the park, plus the CARE RV-based assisted living center and its affiliated RV sites at one end, and, of course, company headquarters and offices at the mammoth mail sorting facility. Smack in the middle of all this is a tiny ice cream shop called the Rest Stop. The Rest Stop Ice Cream Shop is in the middle of it all. 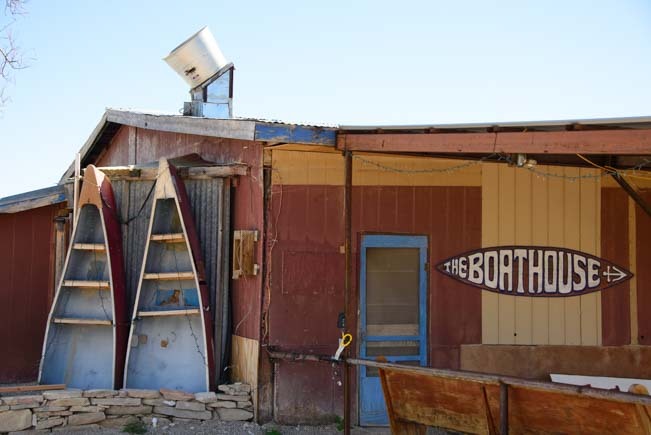 We had assumed that everyone on the Escapees property was an RVer, so it was a big surprise to find that quite a few people live there in houses without RVs. 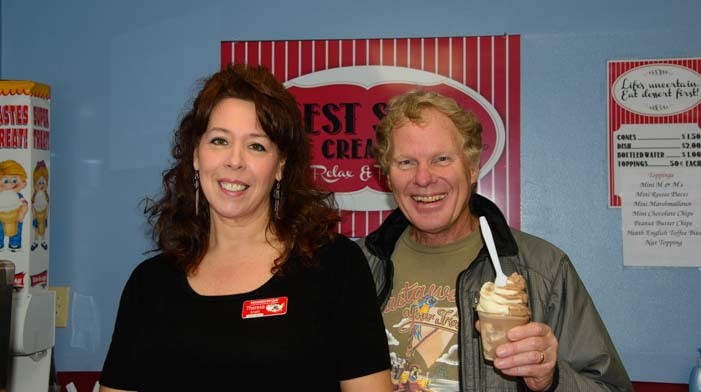 We got chatting with Theresa at the Rest Stop as she scooped our ice cream, and discovered that although she has dreams of casting off in an RV someday, for right now she enjoys living in a house in the community and hearing the travel tales from RVers who stop in for ice cream. She warmly recounted meeting an RVing family with lots of kids who came by. Escapees Corporate Headquarters was just steps from our site, “Wet Camp A,” and we stopped in for a tour. Because almost the entire Escapees staff was at the Escapade rally in Tucson at the time, there was just a skeleton crew working, but the group taking the tour numbered 12 or so people anyway! These free tours are offered twice a week. One of the most impressive aspects of the tour was seeing the Escapees mail sorting facility. Escapees forwards such a large volume of mail to its mail forwarding clients everyday that a US Mail semi-tractor trailer truck has to deliver it all. Escapees even has their own zip code, and they get more mail than the post office in Livingston! Everyday, the mail truck backs up to the sorting facility, triggering a daylong flurry of activity for some 20 people. We watched an enormous machine presort the mail and then walked through a big room filled with filing cabinets where each client has a folder holding their mail. It was a very impressive operation! A US Mail semi trailer rolls up with the day’s mail. We learned that Escapees will soon be offering a service where clients can view a scanned image of each envelope they receive and then opt to have it opened or shredded. This could come in very handy for time-sensitive or important documents that you’re waiting to receive. We have used the mail forwarding service offered by Dakota Post in South Dakota since 2007, and they have also begun to offer a mail scanning service which we have been beta testing for them. It’s pretty neat to be able to see what mail you have waiting for you! The Escapees community tour usually includes a trolly ride all around the campus, but the trolley driver was at Escapade, so we didn’t see that part of the tour. Next time!! 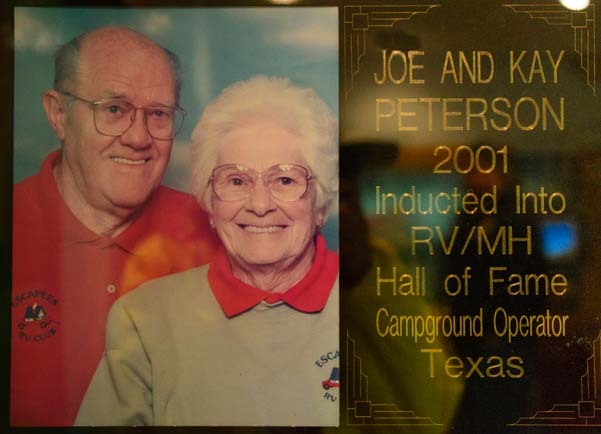 But we did see the plaque honoring founders Joe and Kay Peterson when they were voted into the RV / MH Hall of Fame in 2001. We had seen this plaque at the RV / MH Museum in Elkhart, Indiana, where all the leaders and innovators in the RV industry are honored (if you are ever near Elkhart, a stop at that museum to see the vintage trailers on their Road Back in Time is a must! Our blog post is here). Out in the lobby, our guide showed us two really fun little sticky note pads that used to be included in new members’ packets. 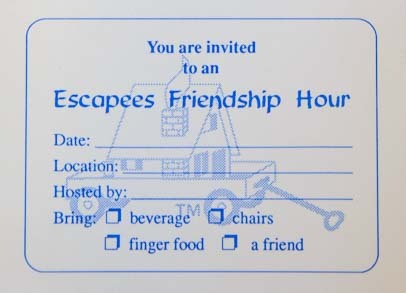 These were mini invitations to “Friendship Hours” that you could fill out and stick on your RV neighbors’ doors to invite them to a potluck or other gathering. What a neat idea that was!! 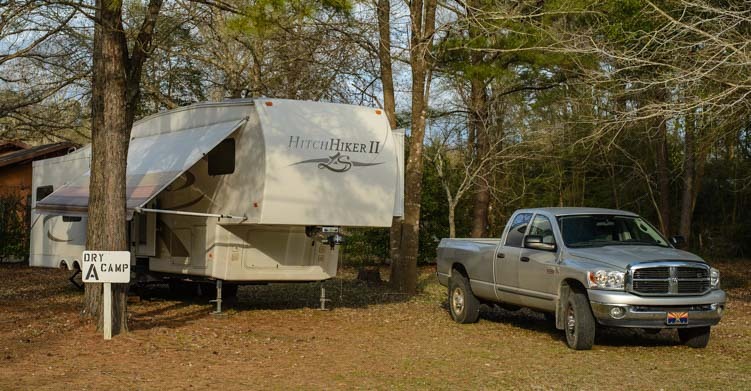 Nowadays RVers turn to RVillage to reach out to both nearby neighbors and RVing friends many miles away. But there was something very homey, cozy and friendly about those little sticky note pads, and I wasn’t the only one in the group who said, “Wow… Where can I get some?” Unfortunately, Escapees doesn’t make them any more. Up on a wall in the main mail sorting room there is a wonderful display of dozens of issues of Escapees Magazine, and I was proud to see a few of our covers in the mix. Escapees Magazine is written by members for members, and the editors are always looking for beautiful photos and technical “How To” types of articles to include. If you are an Escapees member, and you’ve learned something on the road that you want to share, write it up and send it in! I wandered down to the CARE facility one afternoon, curious to learn more about this unique program. “CARE” stands for Continued Assistance for Retired Escapees. 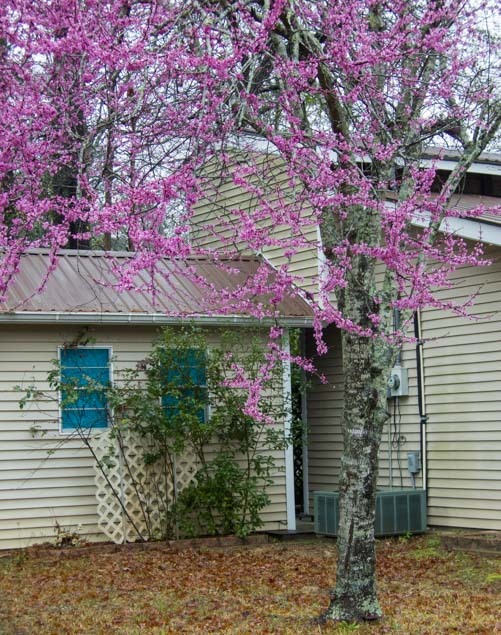 Participants in CARE live in their own RV in a site next to the big CARE clubhouse, and for $874 a month they get an RV site, help with dumping and propane tanks, three meals a day, housekeeping and laundry services, transportation to doctor’s appointments in town and weekly transportation to grocery shopping as well. What an amazing deal! The clubhouse is the hub for CARE participants, and when I poked my head in one room, a group was enjoying watching a live concert being streamed in from the Grand Ole Opry in Nashville, Tennessee, on a huge flat screen TV. I was told that CARE will be offering adult daycare to elderly residents in the general Livingston area soon too. 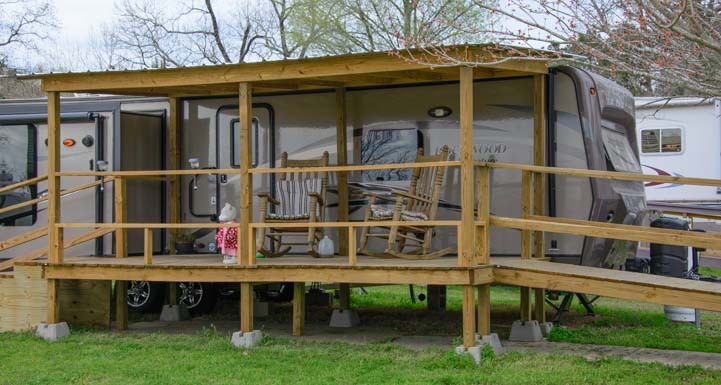 Many of the RVs in the CARE RV sites have big, beautiful, permanent porches built out front. One of these with two huge wooden rocking chairs really got my attention. It just looked so inviting! As I was admiring it, an elderly woman came out on the porch in a bright red sweater and waved to me. Her name was Nedra, and we ended up chatting for quite some time. I asked her about CARE and she said, “Come on, I’ll give you a tour of the clubhouse!” and off we went. She proudly showed me the dining hall, which is a big, open, cheery room. She told me the food was wonderful! Visitors can enjoy an inexpensive meal there too if they let the dining room know by 10:30 a.m.
RVers can workamp at CARE as well, and I talked with several RVers who really enjoy helping out this way, either in the dining hall or driving residents around town. Couples work together in teams, and in exchange for a minimum one month commitment to work 28-36 hours a week (per person), you get a free RV site at Rainbow’s End (with metered electricity) and you also get three free meals a day at CARE. If you work in the summertime, you receive a stipend to cover electricity for air conditioning. Workampers can also work at the other end of the Escapees campus at the Rainbow’s End RV park. I was told that if you work at least 20 hours a week for a month or more, you receive a certificate good for a free night’s stay at any Escapees Rainbow RV Park for every 20 hours you work. 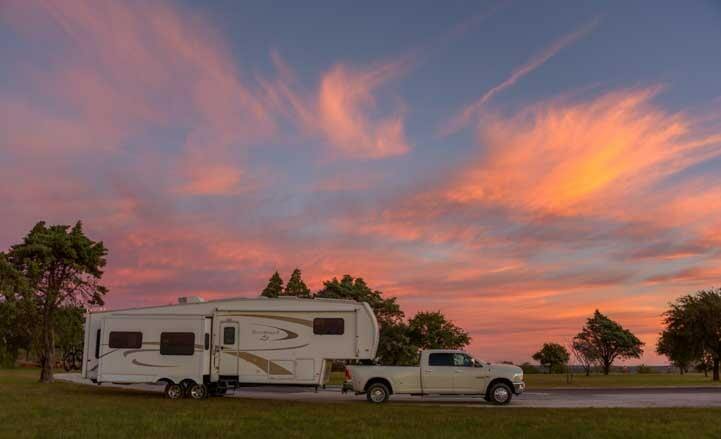 We chatted with an RVing couple who really enjoyed defraying their travel costs this way, working at three or four different Escapees RV parks each year. 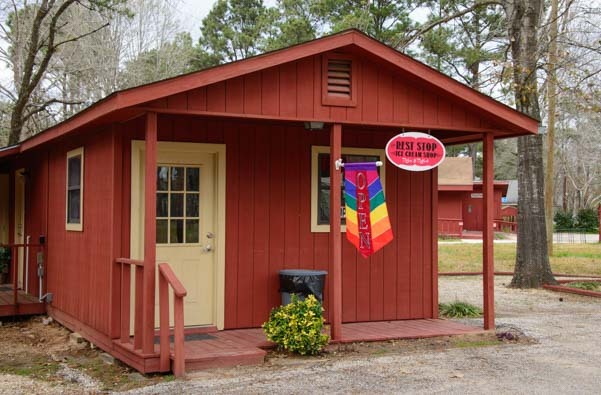 We really enjoyed our stay at Rainbow’s End, and after spending some time in Livingston, Texas, we came away even more impressed by the diversity of the Escapees RV Club than ever. Thank you, Kay and Joe, for creating a special virtual home — and a true community — for all RV travelers!! 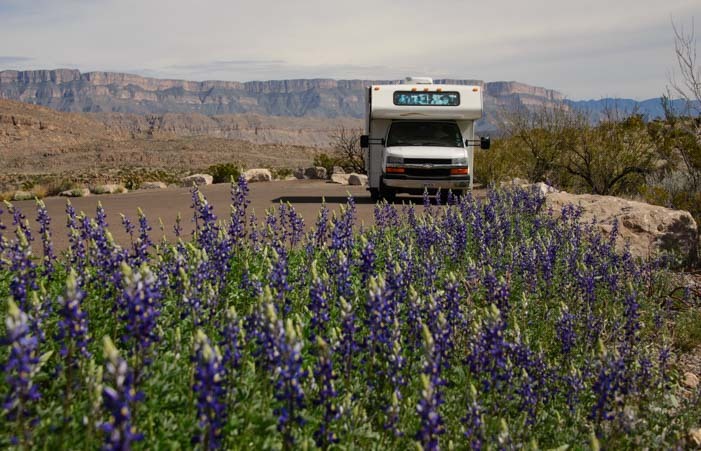 March, 2015 – Continuing our RV travels east from Big Bend National Park, we were headed to Fort Worth, Texas, to do a disc brake conversion on our trailer that would truly transform our driving experience and put a huge grin on Mark’s face. 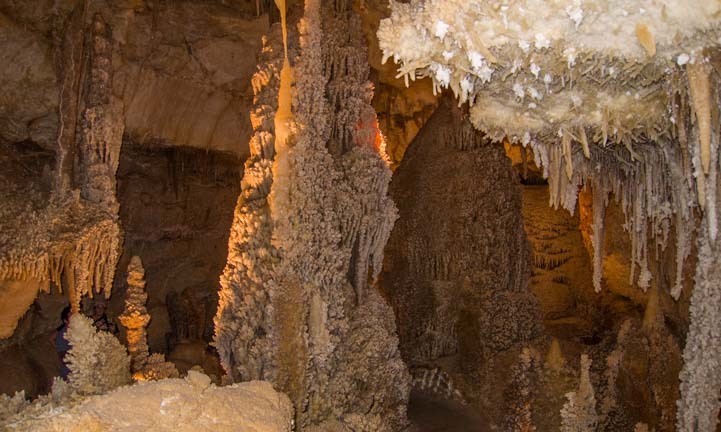 But first we decided to make a brief stop at the sensational Caverns of Sonora, a massive cave system that is considered to be one of the most beautiful caves in the world. 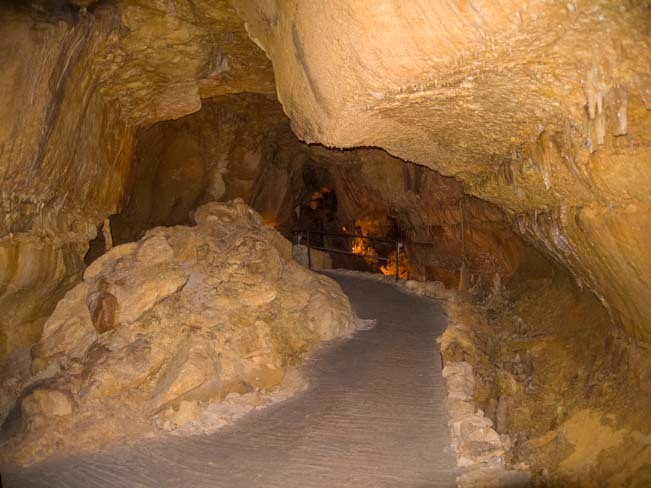 Entering the Caverns of Sonora, we cross the mammoth pit that took 50 years to conquer. 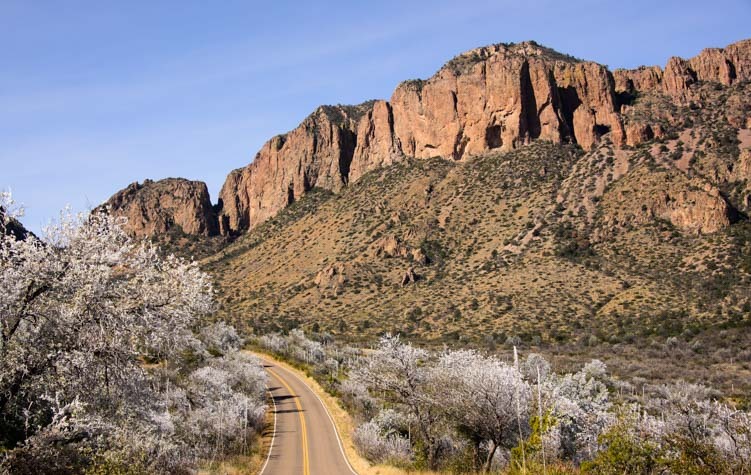 Fortunately for us, and for all RVers, Sonora is right on I-10, just a little north and east of Big Bend National Park, and the caves are just 8 miles west of Sonora. The tours run every 2 hours or so, and when we arrived there was no one signed up for the next tour. By the time it started 50 minutes later, there was a group of about 12! 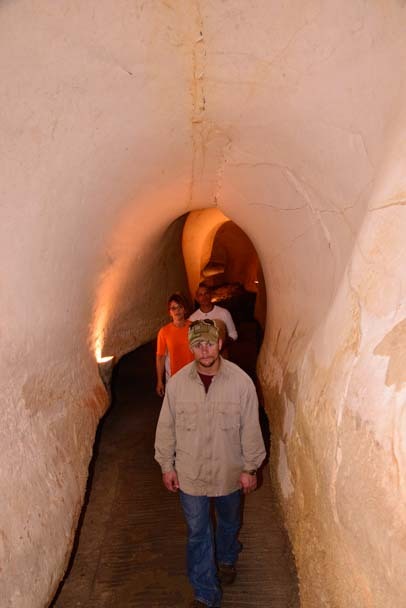 Navigating the cave is easy with a tour guide, electric lights and solid surfaces under foot! This is a “warm” cave, and we were advised to shed our jackets and sweatshirts because the temperature is generally in the low 80’s in the cave. 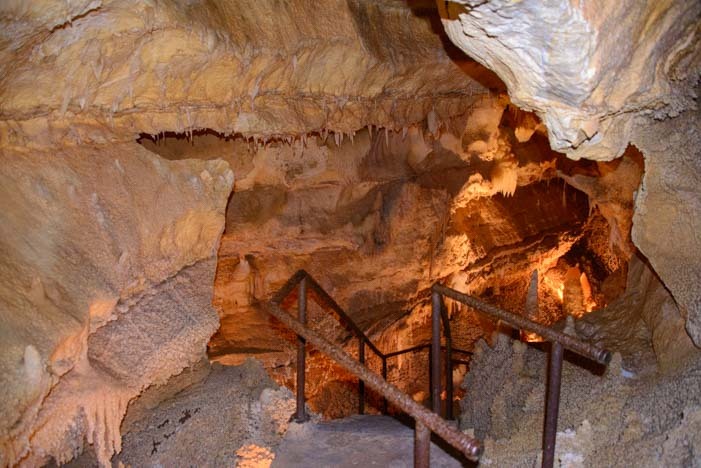 I was a little reluctant — after all, central Texas was in the throes of ice storms — but once we got into the cave, I was glad I did. 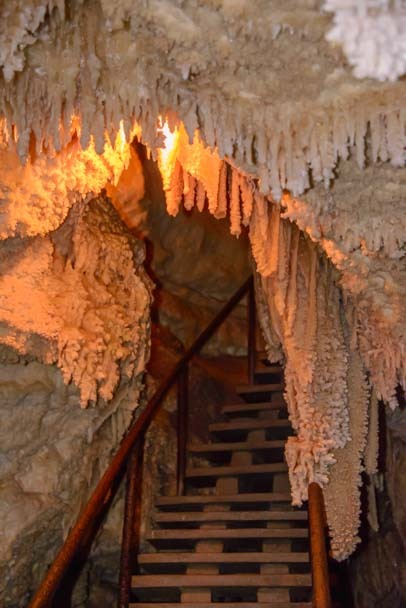 The lighting in the caves is artistic and well crafted, and it makes the calcite formations glow. 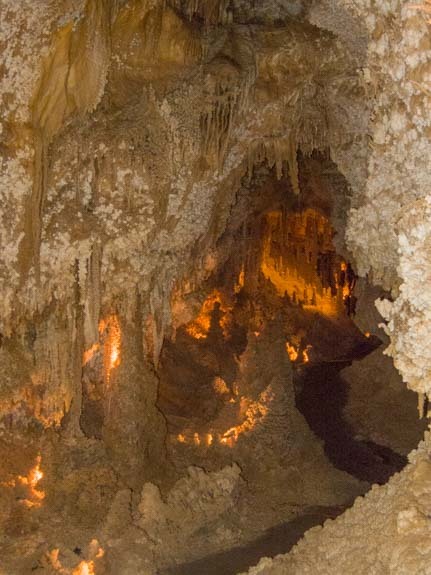 The Caverns of Sonora are on ranch land that was owned by Bill Mayfield at the turn of the last century, and they were first discovered when a rancher’s dog chased a raccoon into a hole. We had to walk carefully so we didn’t bump the “cave coral” all around us. 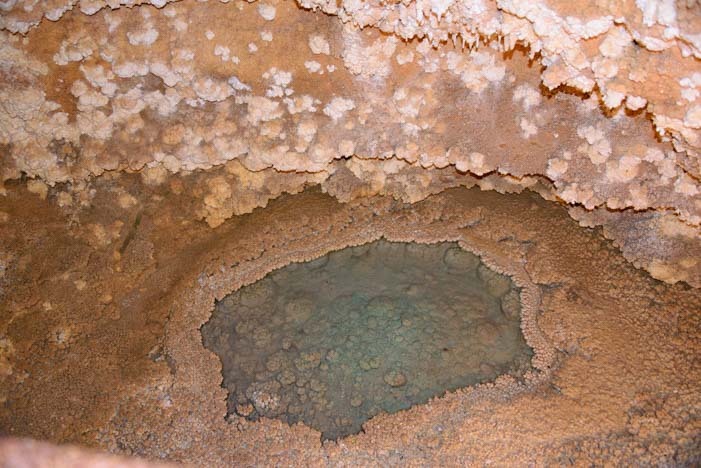 Explorers quickly found out that after about 500 feet of scrambling along a narrow passage from the entrance, there was a massive pit that opened up and blocked the way completely. It took about 50 years for anyone to make it past the pit. It was a daredevil feat for the ones who did, because they had to climb way above the pit, with scant and dim sources of light! 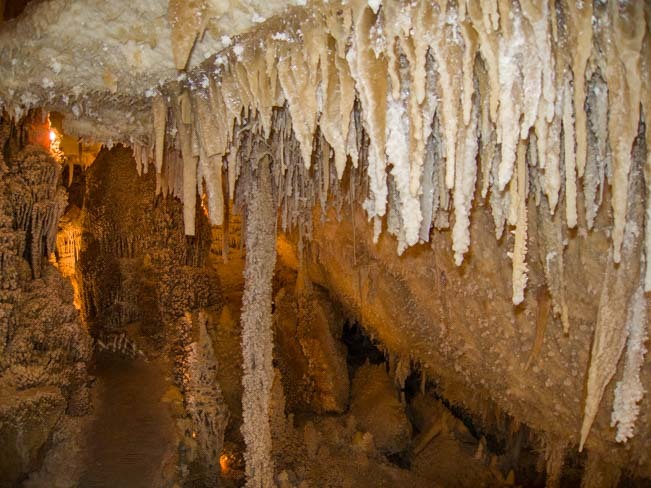 The formations in this cave are exquisite — stalactites and stalagmites everywhere! 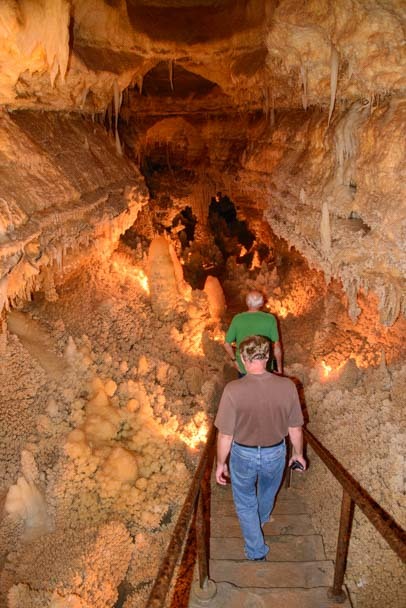 These early explorers discovered that the cave is about 7 miles long and is filled with exotic and intricate calcite deposits and designs created by water filled with minerals dripping from the ceiling of the cave to the floor. There were no signs of human presence at any time, and no animals either. That huge pit by the entrance kept everyone out! Everywhere we turned there were exotic and fragile formations. 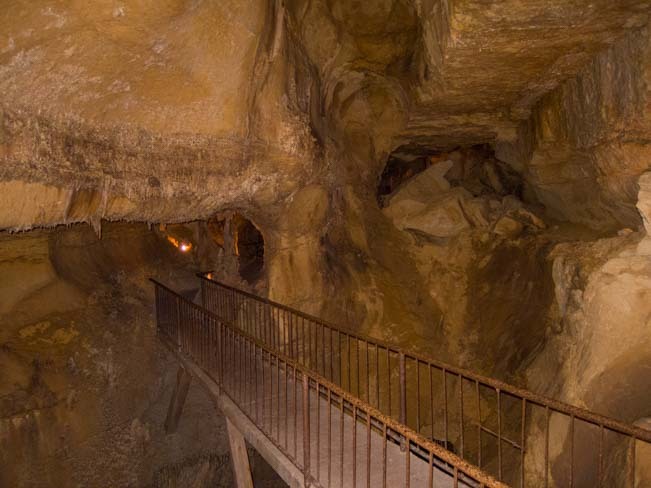 The Mayfield family has operated the cave as a commercial tourist enterprise since July, 1960, and they have done a terrific job of preserving the cave while making it available to the public to enjoy. “Cave coral” or “coralloid” formations — it looks like an underwater world of coral! 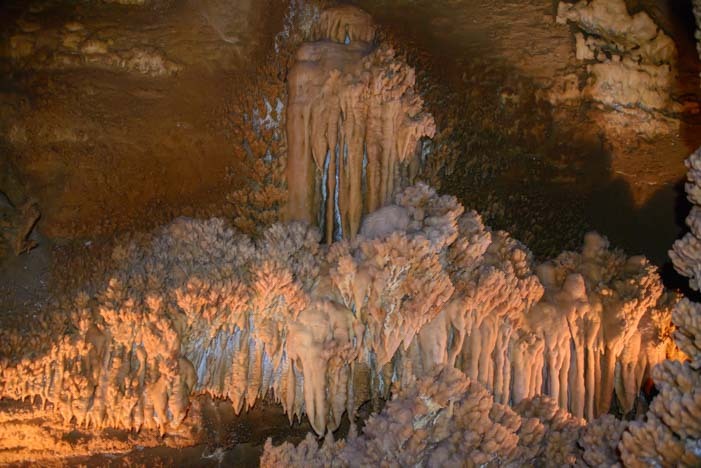 As we walked, the drip formations on the ceilings, walls and floor of the cave became ever more elaborate. In places there were “icicles” hanging from the ceiling and “columns” growing up from the floor. There were even some pools of very clear water. Ironically, tourists from decades ago liked to throw pennies into one “wishing well,” and now the water is tinged green from all the copper. So another area has been established for tossing pennies (for those that must) where there won’t be any environmental impact. We passed several pools of water. 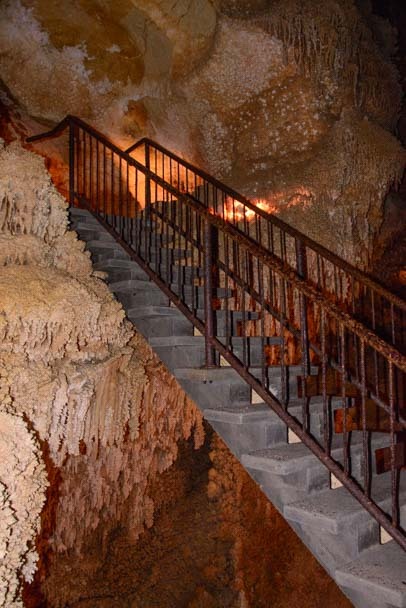 Wonderful staircases and a concrete path took us from one gorgeous “room” to the next, and it was impossible to imagine just how challenging this cave was for the early cavers that tried to map it out and discover its depths. 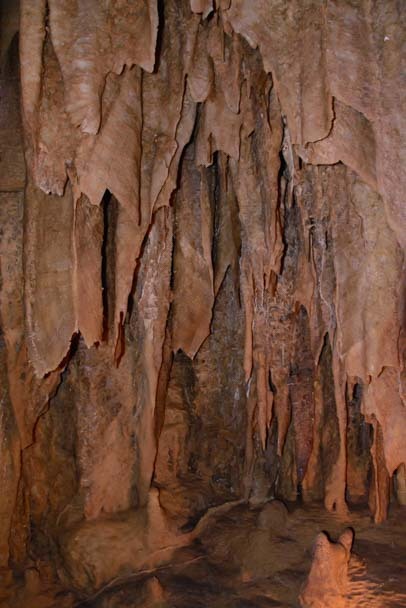 “Cave curtains” are thin films of calcite. Some are translucent. The cave is beautifully and creatively lit throughout. The guide turned on the lights ahead of us as we progressed down the path, and then turned out the lights behind us. This cave is very beautiful. What a treat to see it lit so creatively. The lights were set behind various formations, making them glow as if lit from within. Our path winds through the Crystal Palace. The most ornately decorated “room” is the Crystal Palace, and when we got there we all stopped in awe. The Crystal Palace is just that! 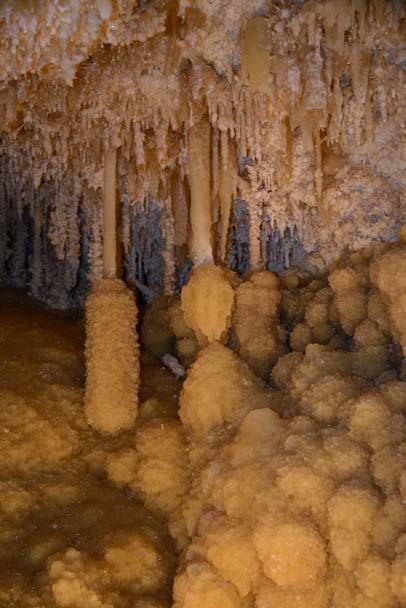 It was filled with delicate stalactites and stalagmites. 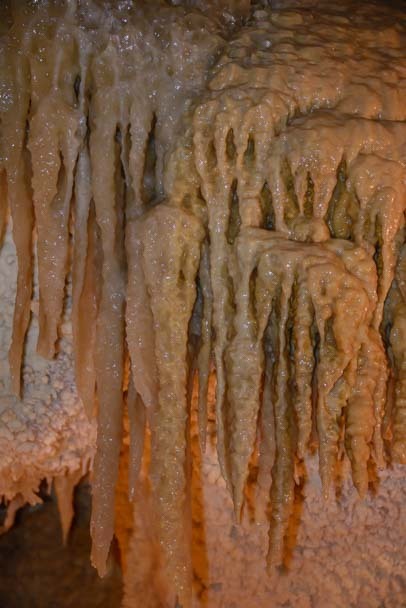 We were reminded that the “c” in stalactite is for “ceiling,” which helps you remember that these formations grow down from the ceiling while stalagmites grow up from the bottom of the cave! explorations of its far corners as well. The tour was over in just under two hours, and before we knew it, we were climbing the many stairs out of the cave. I was surprised to learn that the Mayfield family has had to ward off oil drilling interests that are insistently drilling and testing every inch of soil outside the boundary of the cave. They are hoping explorers find the cave is even bigger than they currently think it is — to help keep the oil drillers at bay. The last bit of the tour took us through the “whalebone room” where the walls were rounded and smooth, as if made of whale bones. What a neat little excursion this was! 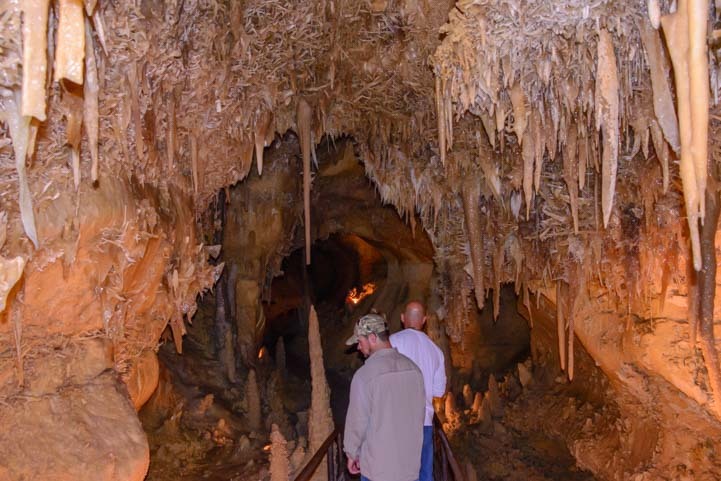 If you are rattling across west Texas on I-10 in your RV, and you are looking for a really fun break from driving, check out the Caverns of Sonora. 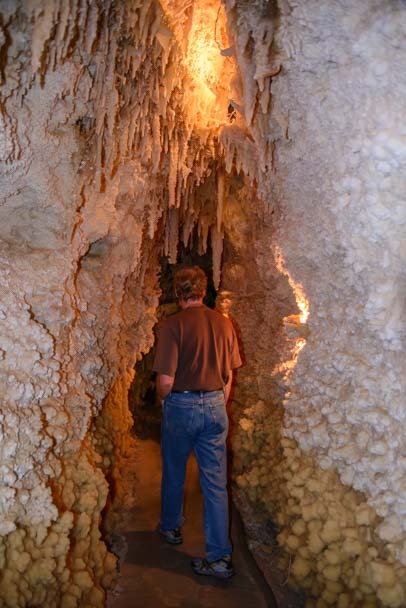 Besides all the pretty calcite formations in the cave, there is a small RV park right there next to the caverns. 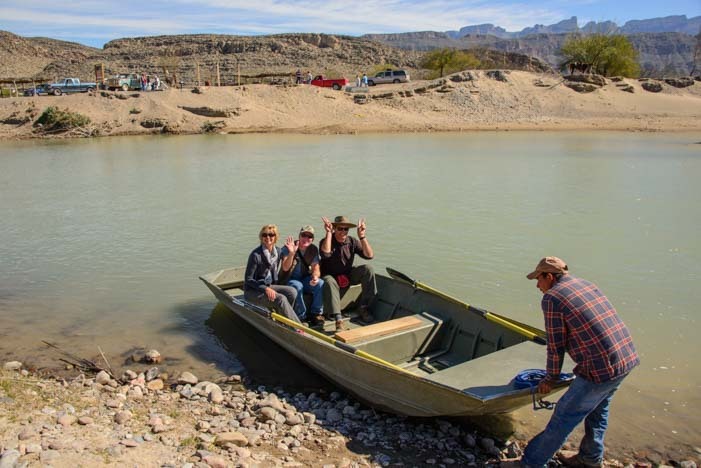 March, 2015 – In the Big Bend area of Texas, the Rio Grande River separates the United States from Mexico, and during our stay in Big Bend, we decided to slip across the border to visit the quiet Mexican village of Boquillas del Carmen on the other side. Back when we cruised Mexico on our sailboat, we saw lots of travel literature that talked about finding the “Real Mexico.” There seemed to be an idea that border towns and tourist beach towns somehow aren’t “Real” or aren’t really Mexico. Yet we found that no matter where we went in Mexico, the culture was distinctly “Mexican,” and I think it was very real to the locals who called these places home. We’re in Mexico (with Aussie/British friends Amanda and David)!! Even so… Would we find the “Real Mexico” we had grown to love so much here in a little village sandwiched between two huge national parks on either side of the border? The answer turned out to be a resounding Yes! The border crossing is as formal as any, and going into Mexico here felt more formal than the last time we entered Mexico at the gargantuan border crossing between San Diego and Tijuana, especially since we were just leaving the US to visit Mexico for a few hours! Once we passed out of the US gate, we walked down a dirt path. 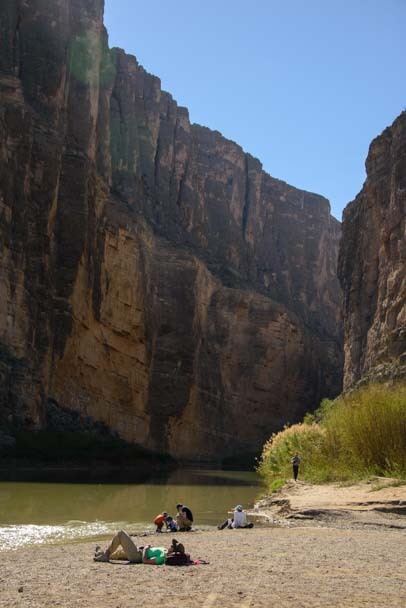 Suddenly we looked up to see a group of Mexican men hanging around on the far side of the river, the Sierra del Carmen mountains towering behind them. 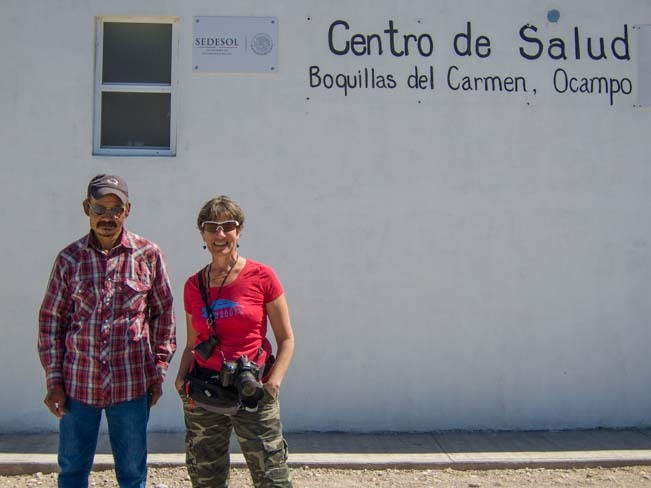 Our Mexican hosts wait — and sing — for us on the other side of the Rio Grande. As soon as they spotted us, one man began singing a Mexican folk song in a very full voice that rang out with wonderful clarity across the river. Ahhh, Mexico!! How this culture loves music! A young man was rowing a boat towards us and we hustled down to the water’s edge. We take the ferry across the border. We hopped in the boat, and as our ferry captain rowed, the welcoming sounds of our greeter’s wonderful song filled the air from the far shore. In just a few strokes of the oars we were disembarking on the other side. At the Ferry Terminal we meet Victor, our singing host, and pay for our round trip ferry ride. The Ferry Terminal consisted of a cable spool on its side, a folding table and a cut-off plastic milk jug for money. The singer (and ticket agent), whose name was Victor, and several other men that we later found out were personal guides were waiting for us. We paid $5 for the round-trip ferry ride and were offered three ways to get to town a mile away: by burro ($5) or by taxi ($5) or walking (free). 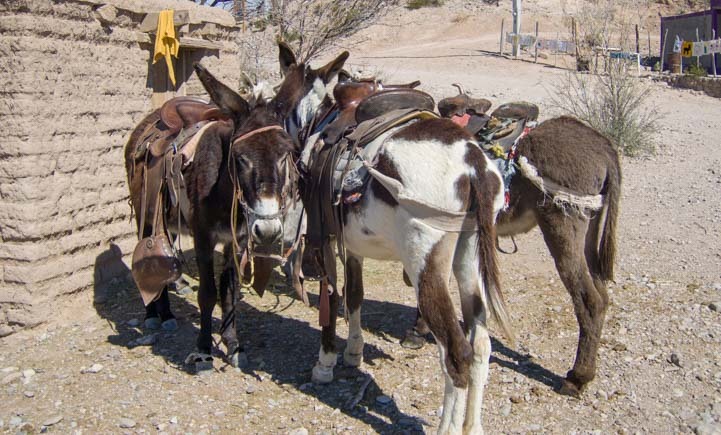 Burros wait to take visitors into town. Other visitors chose to take the burro ride that day. But we opted to stretch our legs and walk. 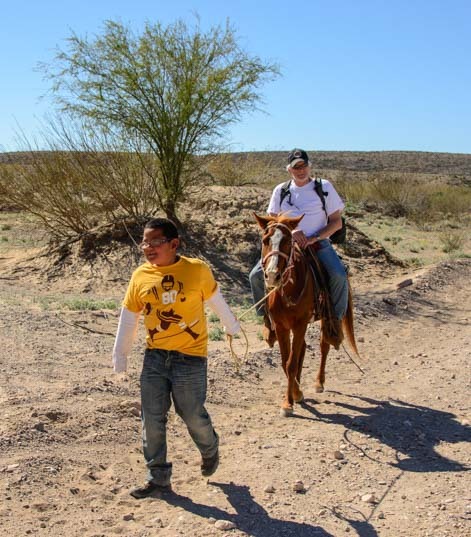 We decided to walk, but other travelers had fun on the burros! 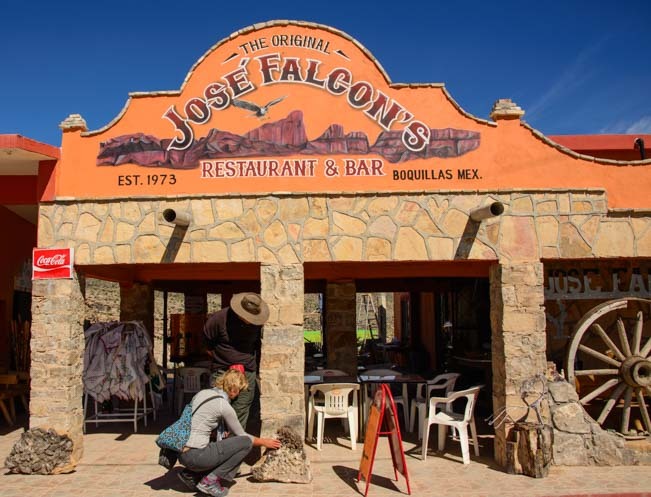 José Falcon’s Restaurant is the biggest game in town. Sure enough, when we got to town, it was the biggest and brightest building on the street — and was one of just a handful of buildings all together! A few doors down on the other side of the street was the other popular cantina. Another option for a beer and genuine Mexican food. Before we could start exploring, however, we made a quick stop at the trailer that houses Mexico’s Customs and Immigration office, and we filled out tourist permit forms and got our passports stamped and were issued short term visas that we returned when we checked out at the end of the day. Formalities, done, we wandered outside and suddenly heard music and singing again. We walked a few paces to find an old man in a wheel chair, his faithful dog at his side. He was strumming a guitar and singing for all he was worth. A street musician entertains us. We had to smile as we watched this musician, because funny as it sounds, this was the real deal. 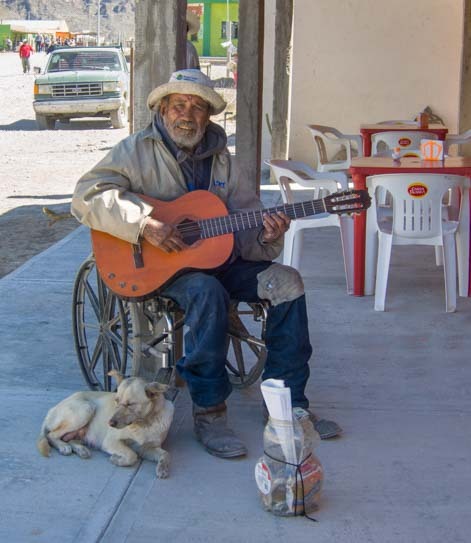 Street musicians give Mexico’s culture a special twist, and we’ve seen them everywhere. They’ve serenaded us on the beach, in out-of-the-way bars, even on the bus, of all places! And now here. He paused for a moment to tell us he was 85 years old. “Born in 1930?” I asked in halting Spanish. “Yes!” He said, his eyes lighting up. He had just lost his wife a few months ago. We wandered down the dirt road a little further and looked up to see two men coming into town riding horses. Was that classic, or what?! Right out of a movie! A couple of little kids were running around with bracelets for sale. The little girl said her name was Maria, but even though she repeated her friend’s name three times, I never quite understood what she said! Our friend David managed to have quite a conversation with both of them! Our friend David finds new friends in town. Throughout all our wanderings, our guide, Fermin (pronounced “Fair-MEEN”), never strayed too far. The guides aren’t formally assigned to visitors, but all the gringos in town for the day were walking with one. He gave us insights into life in this tiny rural village, showing us the hospital where there are two doctors on staff. Our guide Fermin shows us the local hospital. 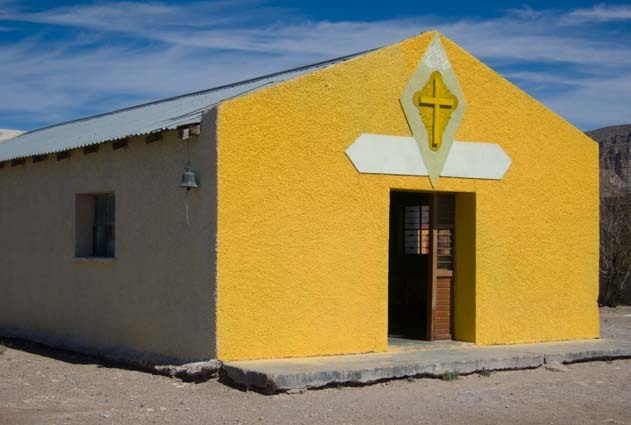 We’ve seen vivid yellow cathedrals in other parts of Mexico, so why not a yellow chapel here? And we were very impressed that the town operates on solar power! 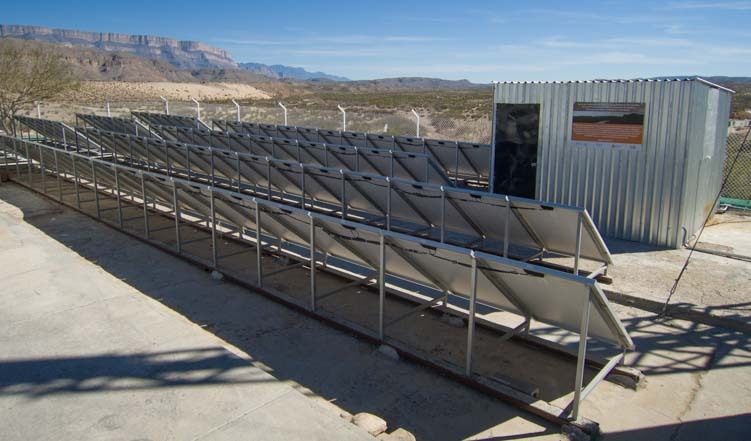 Solar panels power this town. 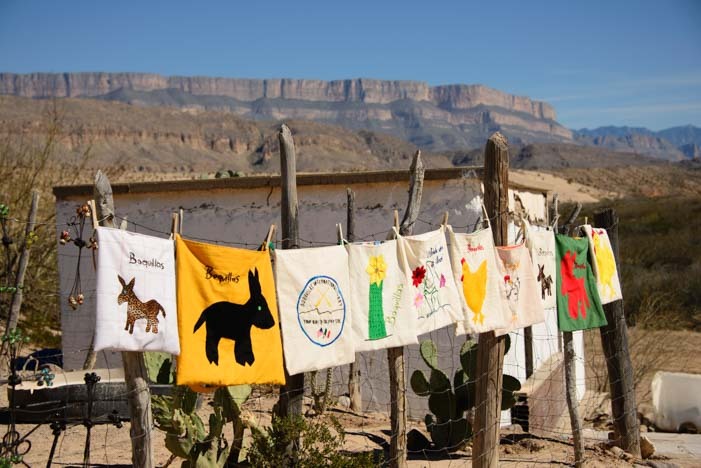 Tourism is really important to Boquillas, and the villagers participate on many levels. One woman makes hand towels and tablecloths that she displayed with clothes pins on a fence. Embroidered towels and tablecloths for sale. 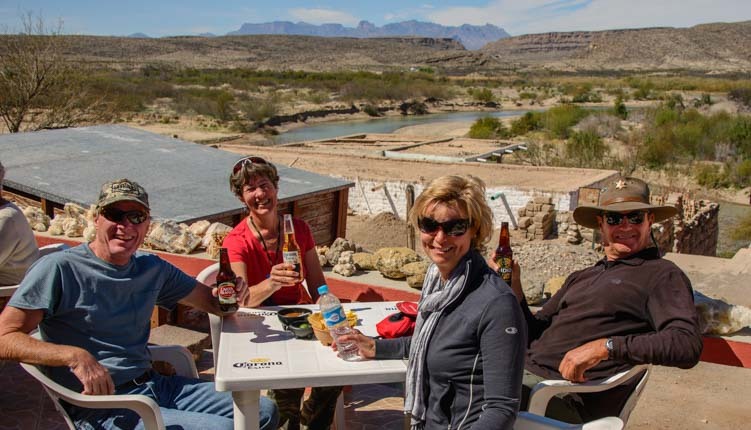 We returned to José Falcon’s restaurant and took a peek out back on the deck that overlooks the Rio Grande. 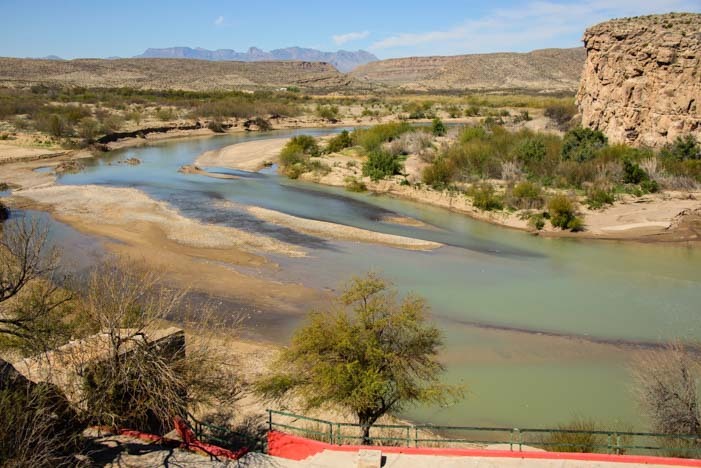 This river is called the Rio Bravo by the Mexicans. The “Falcon’s Nest” overlooks the Rio Grande. Much to my surprise, as we kicked back in the sun and chatted over lunch, I noticed a person at another table who’s face I had seen only in photos online. I did a double-take when I looked at his wife, as I now realized with certainty that they were Ray, who writes the wonderful blog Love Your RV, and his wife Anne, who teaches photography at Anne McKinnell Photography. Who woulda thunk? I swung by their table to say “hello” and introduce myself. 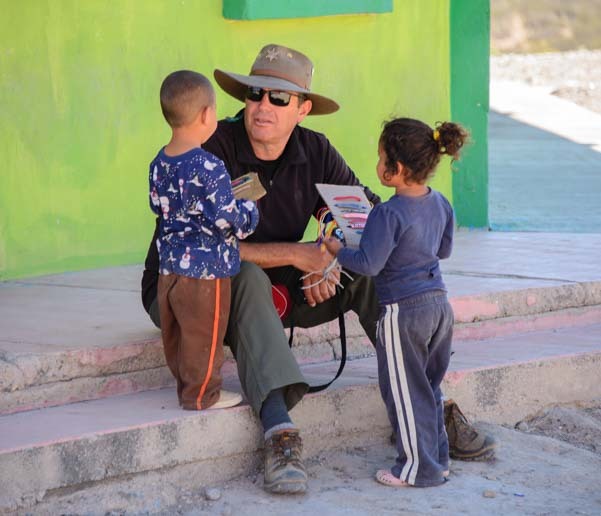 We were all so surprised to bump into each other here in Boquillas, Mexico, of all places! But that’s the kind of fun and magic that makes this traveling lifestyle so special. Settling back with our friends Amanda and David, we savored the afternoon and were very reluctant to leave. This was such a perfect spot to wind up a very relaxing and pleasant day. What a delightful day this turned out to be! As we hung out in the warm sunshine, unwinding in the familiar plastic chairs that are the standard decor in every outdoor cantina across Mexico, we felt ourselves happily transported. If this wasn’t the “Real Mexico,” then I really don’t know what is. Other than having a different view, the feeling and vibe were exactly the same as we found when we traveled through stunning Guanajuato, exotic Palenque, idyllic Huatulco and laid back Zihuatanejo, and each of those places was a true five-star highlight in our journey so far. 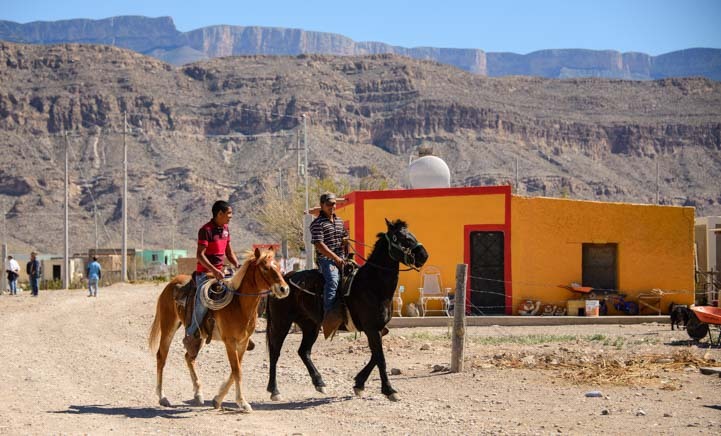 If you are going to Big Bend National Park in Texas, don’t forget your passport, and make sure you treat yourself to a few hours in Boquillas del Carmen where the sweet taste of Mexico is very real. 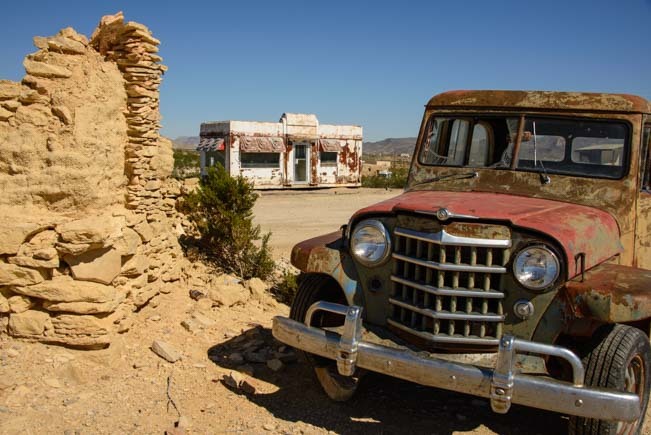 March, 2015 – After many days of hiking and photography during our visit to Big Bend National Park in Texas, we took a wonderful excursion to the little town of Terlingua, just few miles west on Route 170 outside the west end of the park. 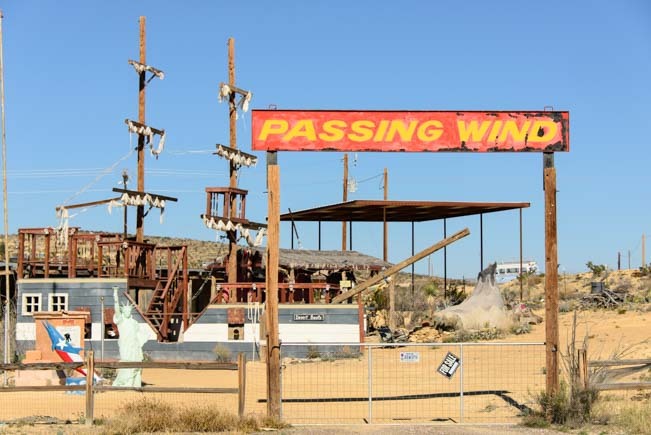 This is a historical mining ghost town that has been brought back to life with a hippie vibe. 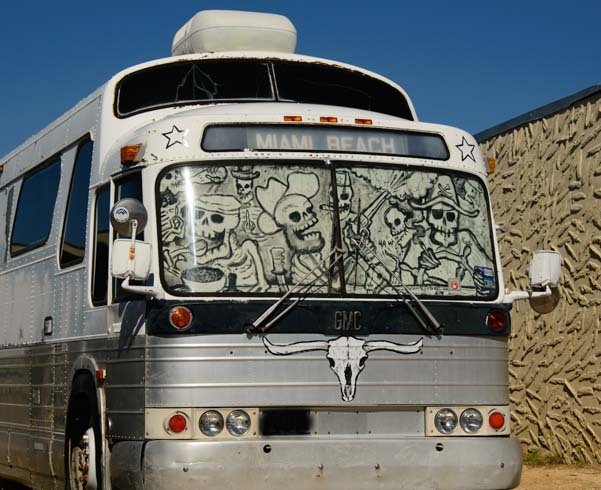 When we arrived we saw a group of folks —all skeletons — having a party in a big ol’ bus heading for Miami Beach. As we drove further into town, we looked over and saw the masts of a ship. What?? We backed up and looked again. Yup! 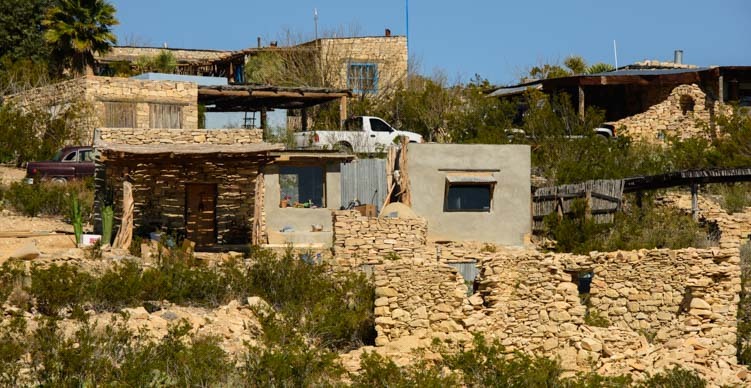 Apparently someone was dreaming of the sea when they built their home in Terlingua! Wait, is that a ship?! Yes, it is — and it’s Passing Wind. The town has its origins in the 1880’s when cinnabar was discovered. Cinnabar, we found out, is not a candy bar version of the cinnabun. It’s a metal from which mercury is extracted. 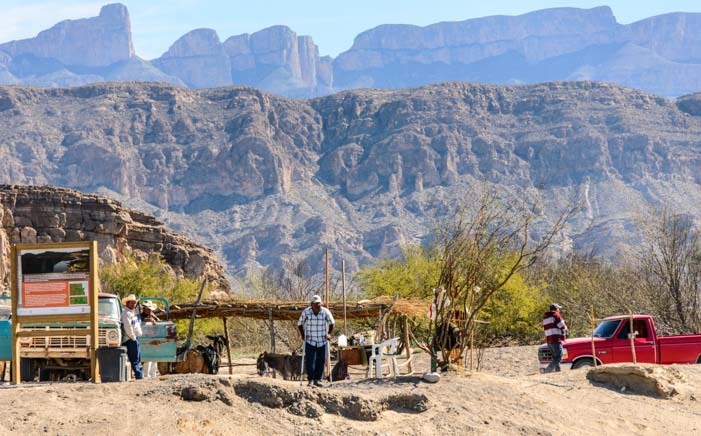 The Chisos Mining Company set up shop shortly after the discovery, and immigrant miners from Mexico soon began working the mine. We found it fascinating to wander around the old cemetery. All of the deceased had been Mexicans, it seems, and the style of the cemetery was distinctly Mexican. 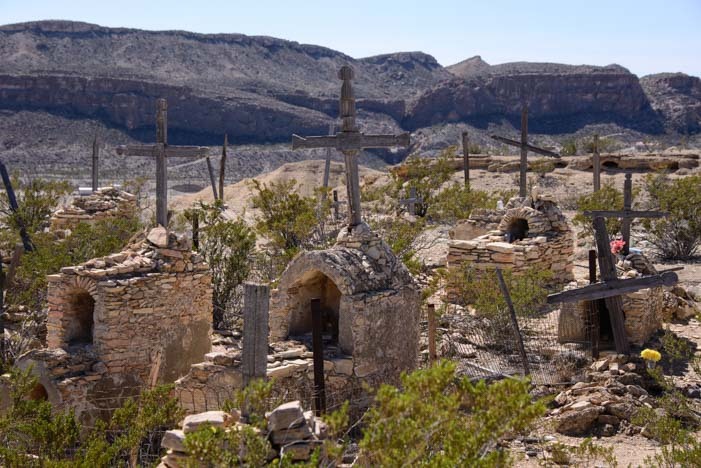 Terlingua has a wonderful ghost town cemetery. The style of the graves was distinctly Mexican. There are all kinds of headstones and graves in the cemetery. Many graves are marked with a simple wooden cross. But some are quite elaborate. 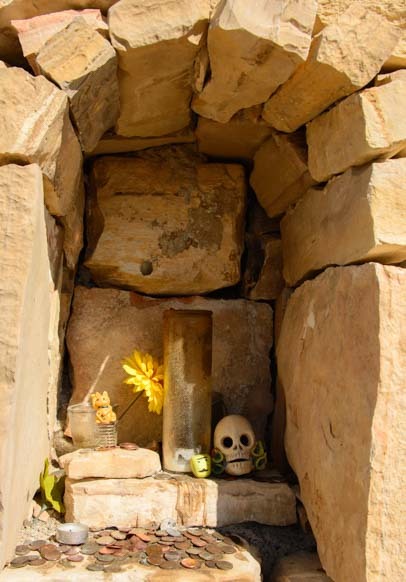 Many of them have a small stone shrine that shelters trinkets of various kinds. 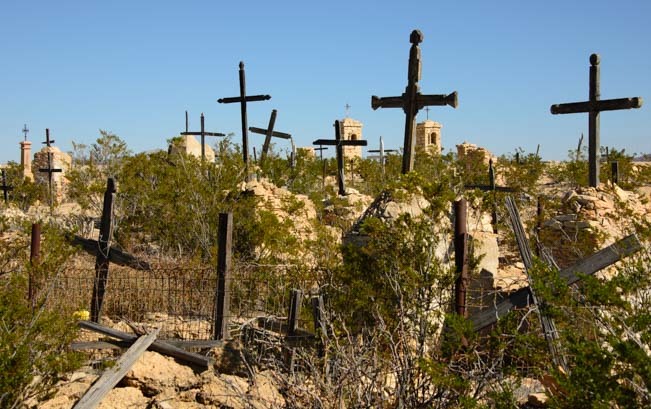 We heard that the Mexican “Day of the Dead” celebration (the day after Halloween) is quite an event here in the Terlingua Ghost Town Cemetery! I would love to see the Day of the Dead celebration here! Nearby there are ruins of the homes the miners lived in. We felt like explorers as we prowled around some of the different buildings. There are lots and lots of buildings, and they are in various stages of decline. Some of the ruins are in better shape than others, but all make great photo ops! None of them have windows or doorways that are intact, but there were some pretty views from where the buildings were situated. The homes might have been small but they had great views. What stories could these walls tell? 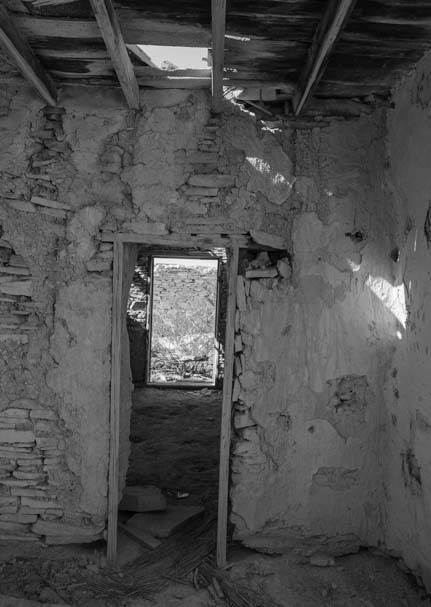 The Chisos mine was at its heyday in the early part of the last century, because Mercury was in high demand during WWI. However, even though there were hopes that there would be another boom cycle for mercury during WWII, it never materialized. So in 1946 the mine was abandoned. 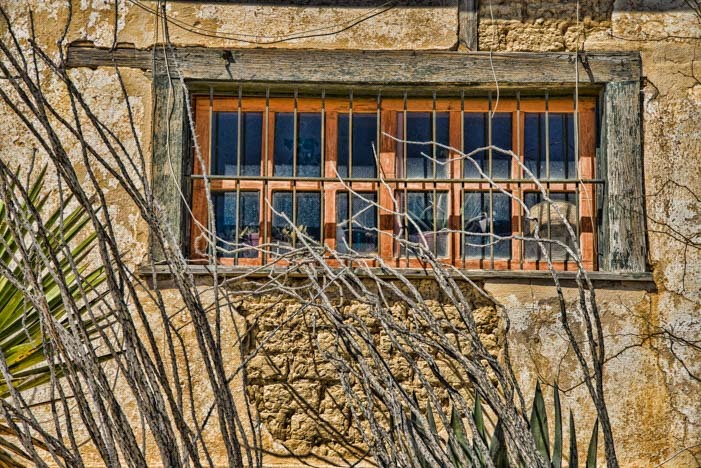 Today, people have moved back in and started making use of the ruins, breathing life back into them and incorporating the ruins into their homes and businesses. New homes and business rise up among the ruins. There is a sense of history all around town. The old movie theater is now a restaurant and bar with the rusting relic of an antique car out front. 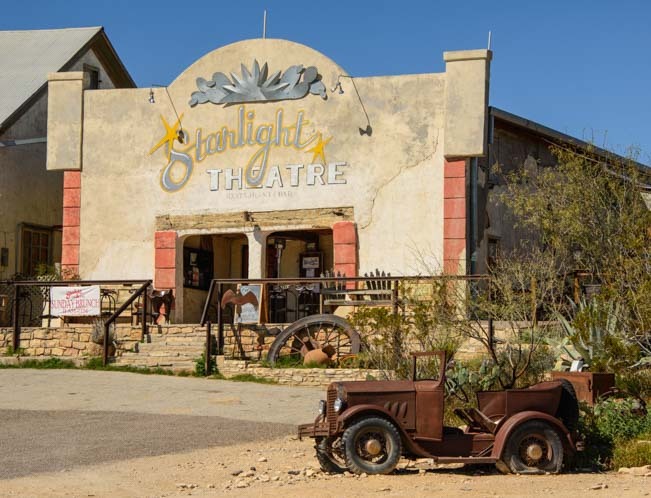 The movie theater was called the “Chisos Theater” in the 30’s. Now it is a restaurant and bar. 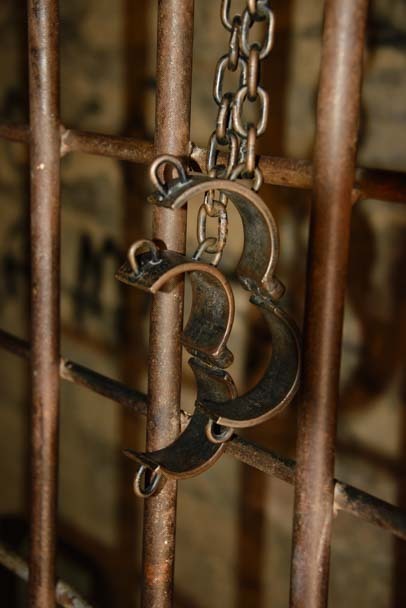 Nearby is the jail, with antique handcuffs hanging from the bars!! Tools to keep the town tame! 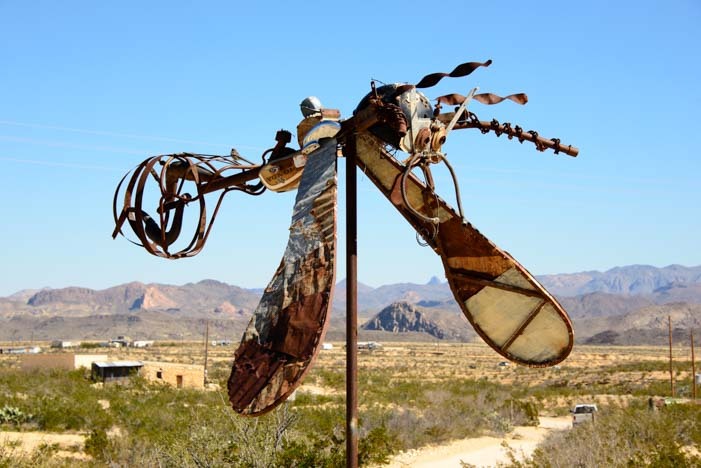 This is a town that is just a little offbeat, and a local artist has created some intriguing metal sculptures. One is a very large flying bug! 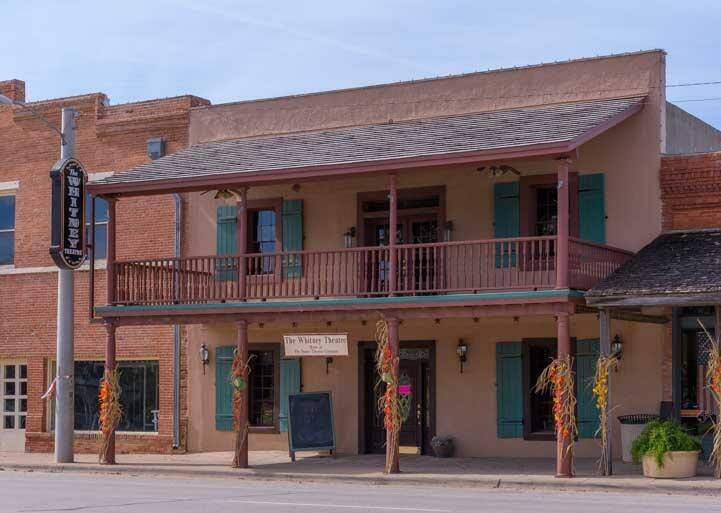 But a little B&B, called La Posada, had wonderful Mexican food and four rooms to rent. A pair of long distance cyclists were staying there, and they were poring over maps. This seemed to be the place the locals liked to come and hang out in the mornings, and we met a man in his 80’s who walked 3 miles each way from his home to get a coffee and chat with his friends here every morning! 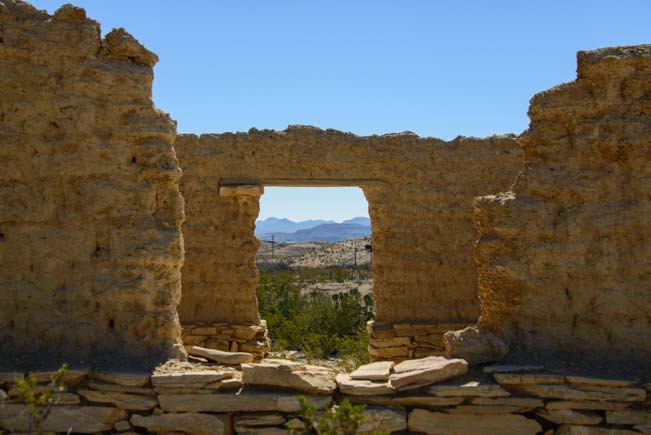 He wore a crisply pressed shirt and jeans with a big cowboy belt buckle and cowboy hat, and he said he just loved living in Terlingua. 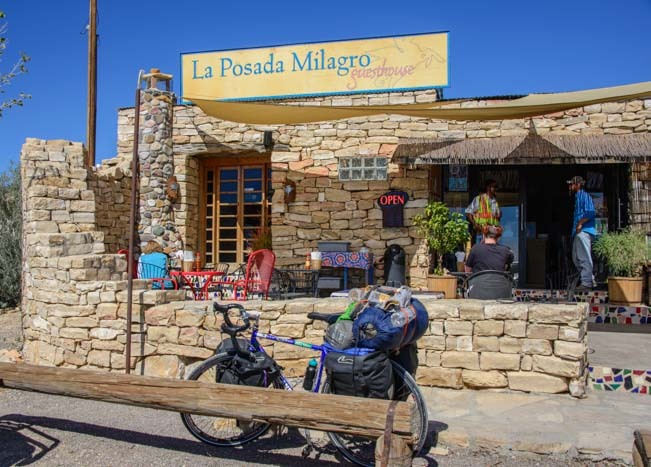 La Posada is a cute place for a meal or an overnight, and it’s where the locals hang out over coffee. 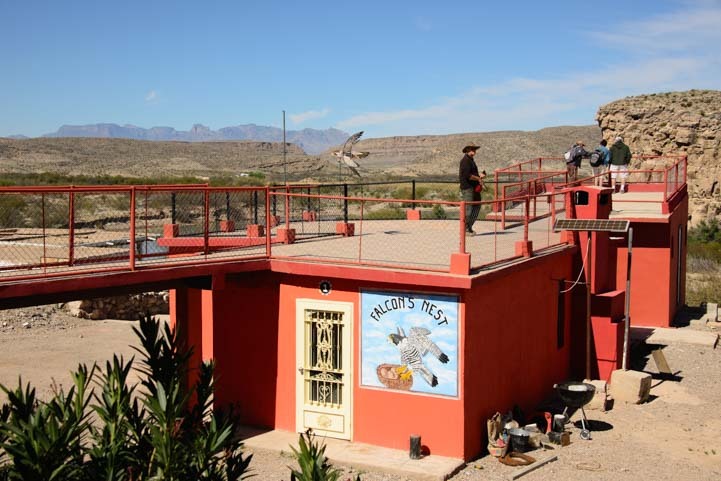 If you are heading to Big Bend, and you’ve gotten your fill of nature in the National Park, a side trip to Terlingua can make for a really fun change of pace! 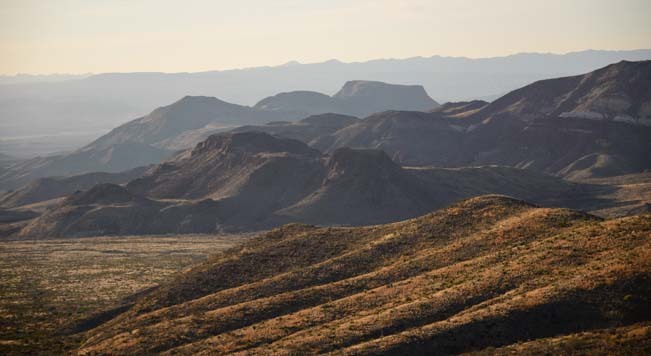 February, 2015 – Big Bend National Park in Texas has a really varied landscape. 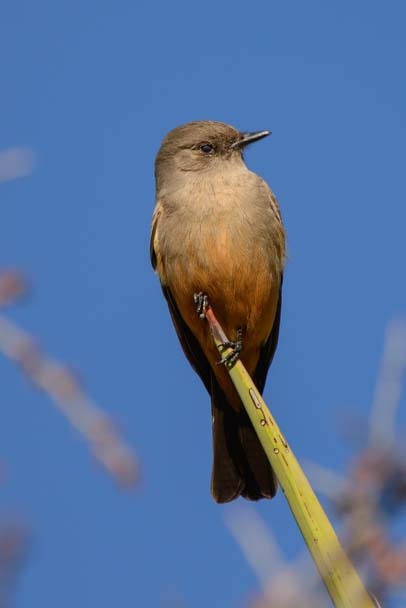 It is possible to go from a river habitat to a desert habitat to a mountain habitat without ever leaving the park! 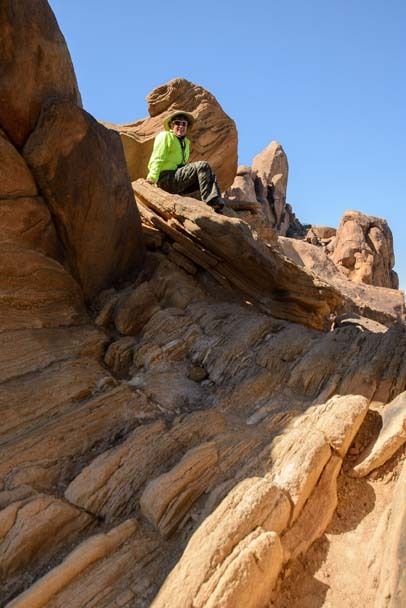 There are lots of hiking options in each of these terrains, and we enjoyed sampling the different locales, sticking to lower elevation hikes on cold days and higher elevation hikes on hot days. 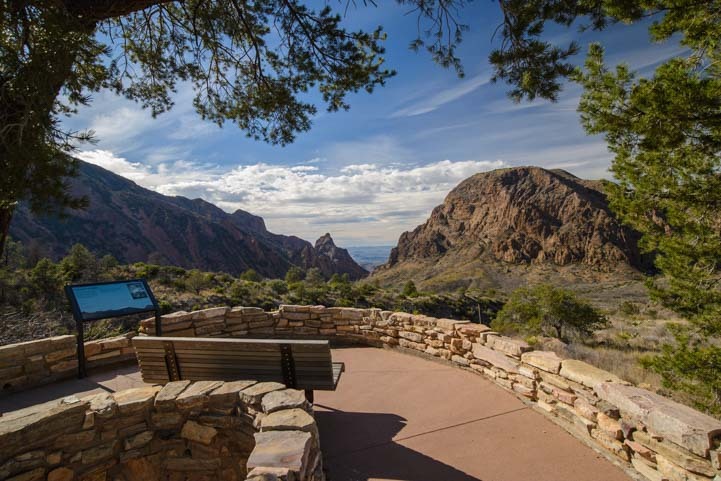 The heart of the park is the Chisos Mountains, a range that juts up from the desert floor (down around 1,800 feet elevation), and soars to heights of over 7,800 feet. A quick walk out to an overlook gave us some beautiful views. 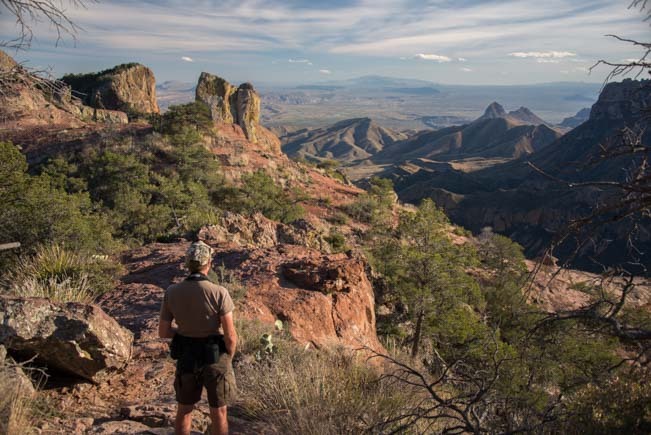 An overlook in the Chisos Mountains. 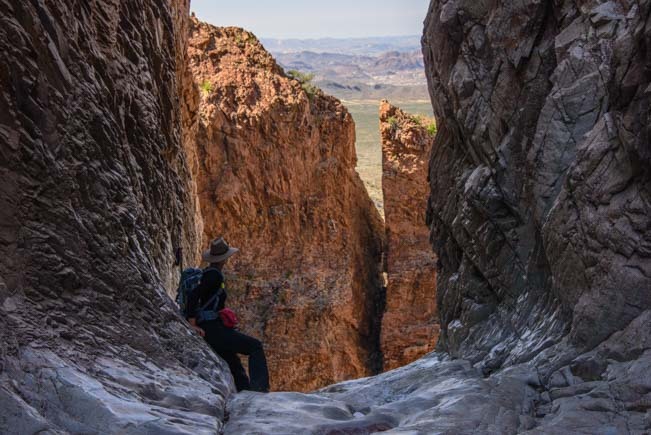 We hiked the Window Trail one day, an easy 5.6 mile round trip hike from the central lodge. Because of the huge variations in elevation in this park, any mountain hike like this one is good for a warmer day. Beginning the Window Trail hike. We expected to find a “window” somewhere along this hike. Descending a scenic dirt path, we were amazed when we suddenly found ourselves in a fun little canyon that was lined with large, flat and smooth rock that had been worn down over the ages by Oak Creek. 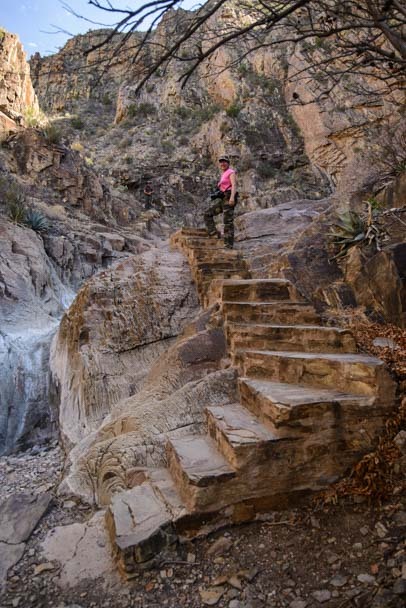 The rangers have carved some really neat stairways through this part to make the hiking super easy. Stairs make this hike even easier! We were still on the lookout for that “window” as we made our way across the cool, shaded rocks. What we found, however, was not a window so much as vast opening in the canyon walls that peeked out at the desert floor in the distance. It was very dramatic — but quite slick too. Our intrepid RVing friend, Amanda, braved the slippery slope and went out for a closer look. 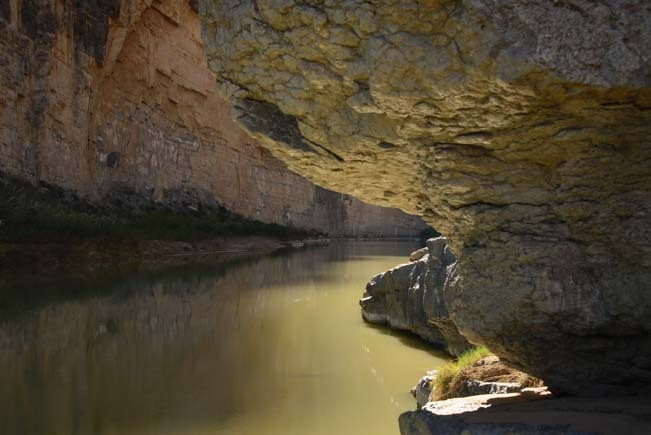 The Santa Elena hike is down at the desert floor level of the park at the southwest end, and it follows the Rio Grande river into another stunning canyon. The scenic drive to get there warmed up our camera shutter fingers, and when we arrived at Santa Elena we found people out enjoying the warm sunshine on the banks of the river. Farmilies played on the edge of the water, and other folks kicked back for a little relaxation in the sun. This 1.7 mile hike involves a lot of climbing, twisting and turning through a series of switchbacks at the beginning. At one switchback I noticed a beautiful glow coming from behind the rocks out on a ledge. 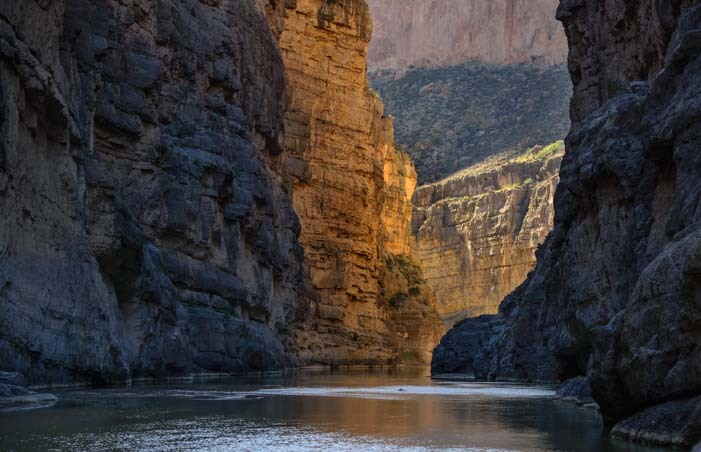 I left the trail to go see what I could see, and soon found myself precariously tip-toeing along a steep rock face with the Rio Grande twinkling up at me from many feet below. I managed to get past the spooky part and found a huge rock overhang that was beautifully lit in the late afternoon light. 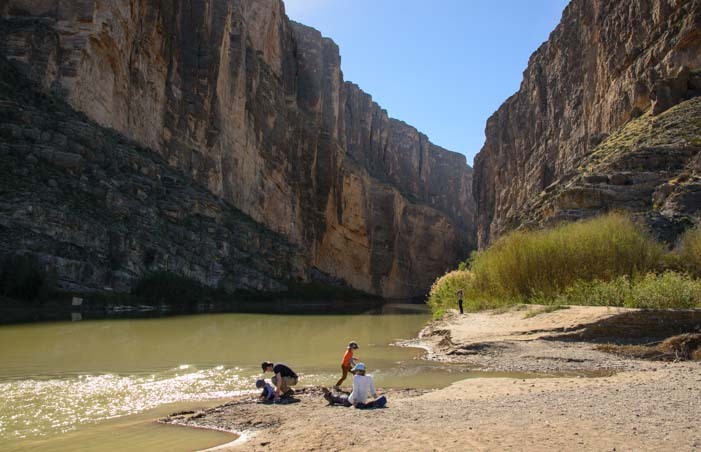 Santa Elena Canyon has a beach in front of it! A nice place to kick back and get some sun. Late afternoon light glowing behind a rock overhang lures me off the trail. Once I got back on the trail, I realized I had totally lost track of Mark (and we’d forgotten to bring our trusty two-way radios…darn!). I kept asking hikers that were on the return trip if they had seen a guy in a gray shirt taking lots of photos. I got plenty of reassurances that he was ahead of me — and that all the climbing was well worth the views at the end! Hikers returning down the trail ahead of me. 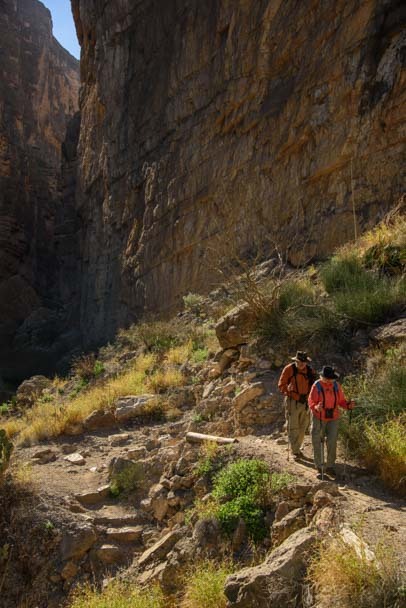 We had chosen to do this hike in the afternoon, and that turned out to be a great time to go, as the sun had finally penetrated the depths of the canyon. Photographers who were there in the morning said the light hadn’t been great — but the shade would be a welcome respite at a hotter time of year! When I finally caught up with Mark, the trail was empty, and we were the only ones in the wonderful big open area at the end of the trail. Huge boulders begged to be climbed on, and a fabulous view between the lofty canyon walls opened up to the sunset-lit cliffs beyond. The Rio Grande laps boulders on its way out the canyon. 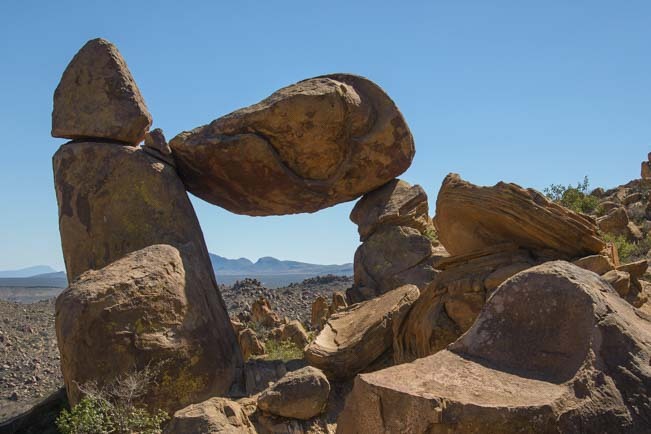 After enjoying the cool rock walls carved by creeks and canyons that we saw on the Window Trail and Santa Elena hikes, we then sampled a true desert hike out in abundant sunshine: the Grapevine Hills hike. This hike was at the desert floor altitude, but instead of finding ourselves surrounded by sheer rock cliffs that had been formed by a flowing river or stream, we passed through a wide open area that was rimmed with wonderful rock hoodoos. The further we went on the trail, the more fun this hike became, as it twisted and turned its way into the rock hoodoos. This was like a kid’s playground. We scampered all over the rocks, feeling very much like kids, and at the end of the hike we found the signature rock formation — a balancing rock. 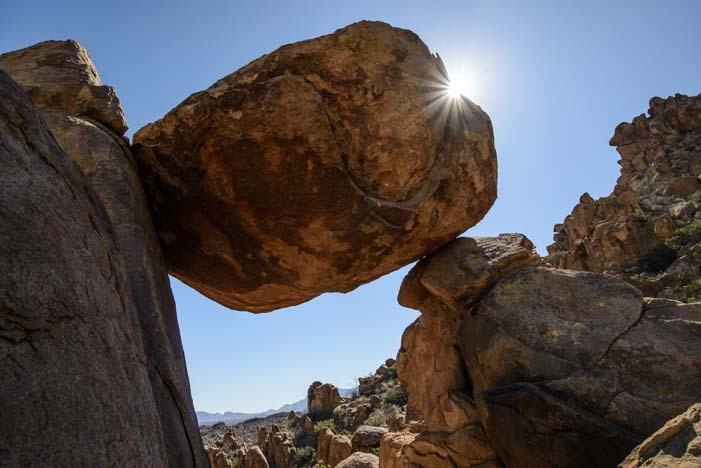 The Balancing Rock at the end of the Grapevine Hills Hike. Looking through the balancing rock. Having fun crawling around on the boulders. 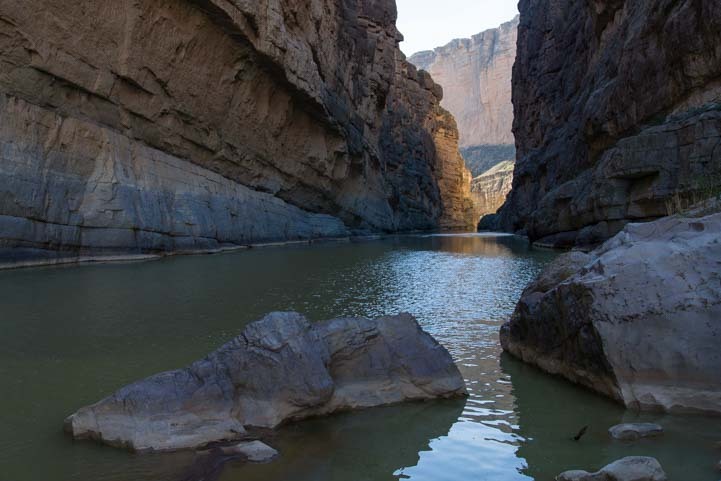 The wonderful thing about Big Bend National Park is that you can pick your destinations within the park to suit the climate of the day. We saw both hot, dry weather and freezing cold, wet weather during our two week stay, and we were grateful that during the heat we could play outside in the mountains and during the cold spells we could hang out at the lower elevations. We also saw a very unexpected weather pattern that we’ve never experienced before: a thermal inversion between the desert floor and the mountains. 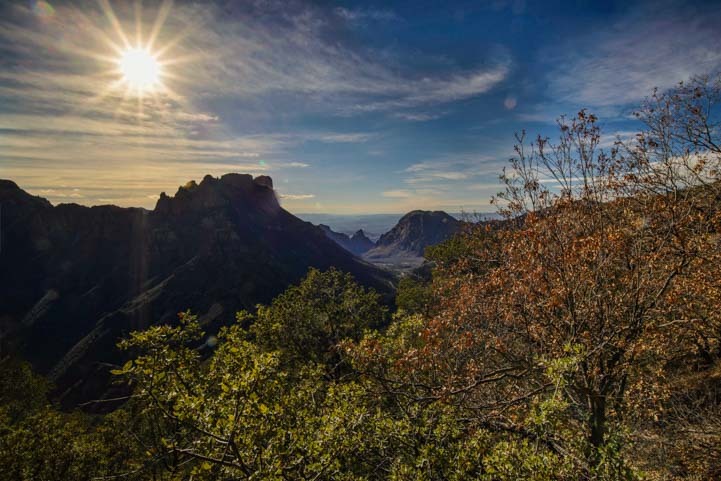 For quite a few days it was 15 degrees warmer in the Chisos Mountains than it was at the lower elevation parts of the park thousands of feet below! Ascending the Lost Mine Trail. 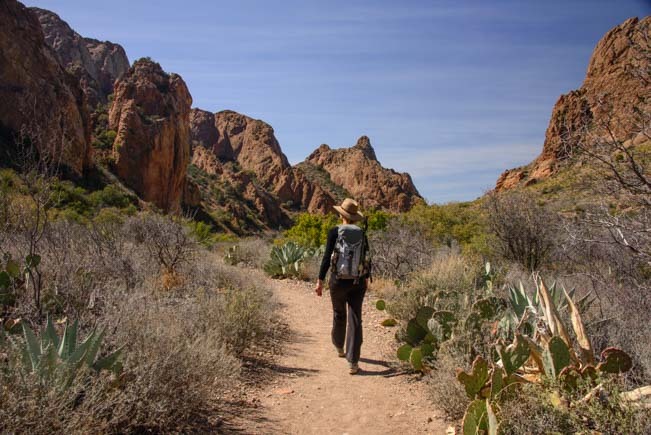 Another very popular hike is the Lost Mine trail. This 5.1 mile hike took us on a steady climb through woods and trees, opening up after a while to huge views. We did the hike in the afternoon, so the mountains that filled our views as we hiked were shaded and not as dramatic as they could be. As we approached the summit, the trail took a turn, and the golden light of late afternoon lit up the distant mountains in spectacular color. Like the other hikes, this end point was a true playground, with boulders to climb on and spots to perch and enjoy a snack with a view. The summit opens up dramatic views in the late afternoon sun. I just LOVE that tree!! 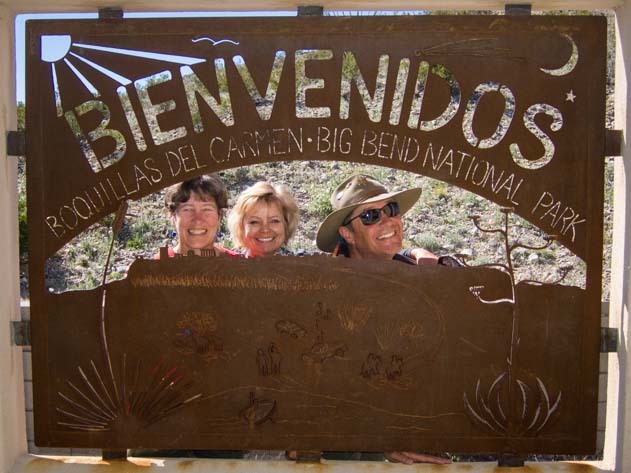 Big Bend is a hiker’s paradise, and many people we met were embarking on multi-day backpacking hikes across the park. We stuck to short day hikes, but found them all very fulfilling. Backpacking is great, but there is something about having a warm, soft bed and no twigs or rocks in your back at night that we really like, especially when you have a beautiful view!! 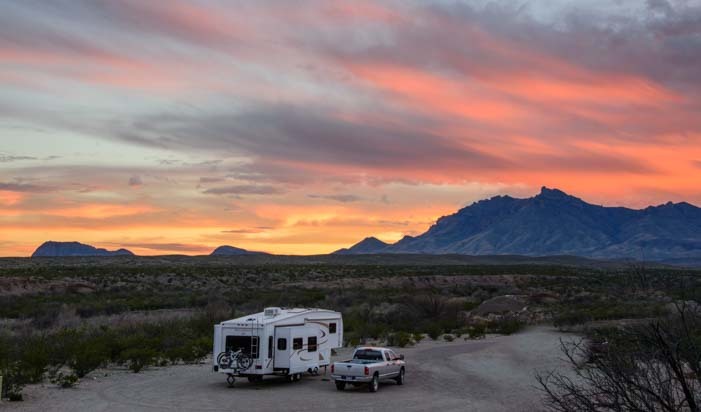 (Here are some details about boondocking and RV camping in Big Bend). 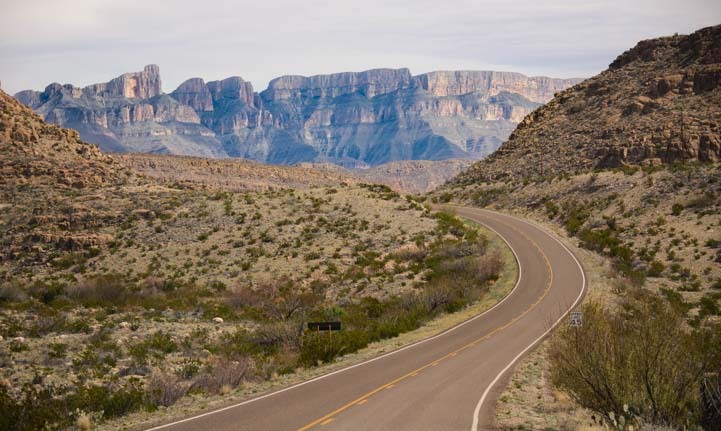 Big Bend National Park TX – Vast and Varied with Views! 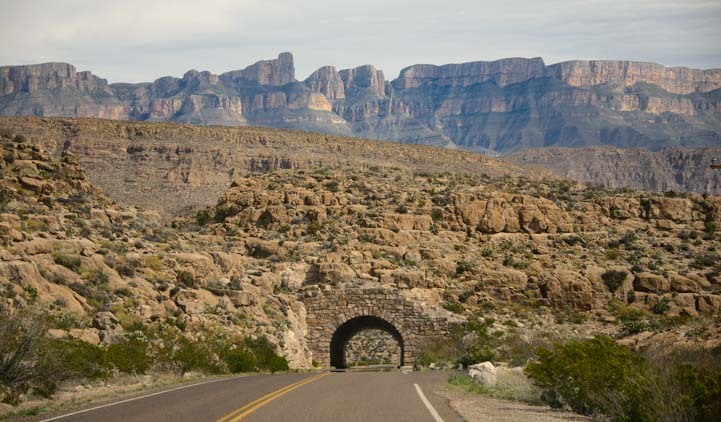 February, 2015 – The first thing we noticed about Big Bend National Park is the sheer size of the park. Everything is bigger in Texas, of course, and this park is no exception. Simply driving from one area to another covers many many miles. But the great thing about these drives is that they pass some wonderful scenery! 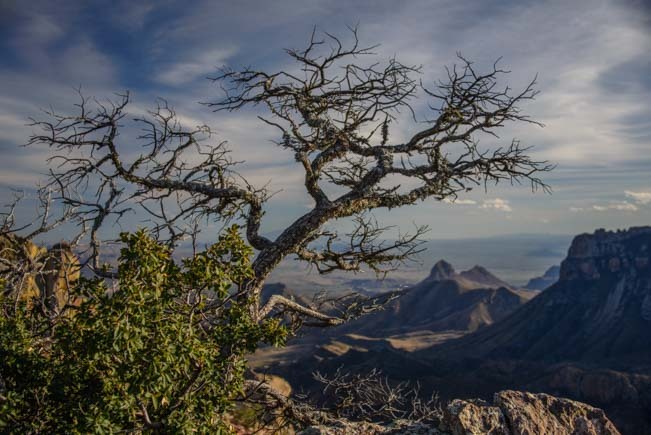 Sweeping views in Big Bend National Park! Don’t worry, RVs fit through this tunnel! The Sierra del Carmen mountains peek from behind a ridge. 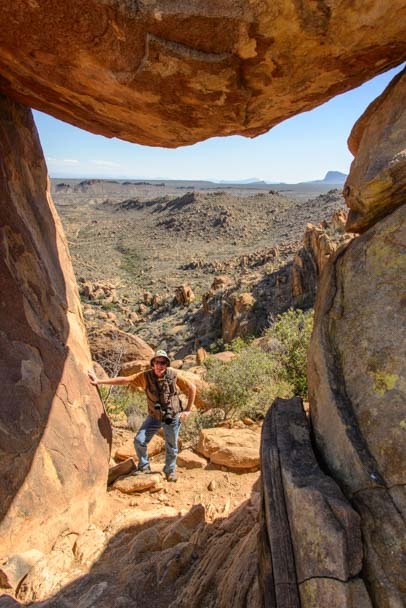 The terrain is really varied in Big Bend National Park, and that is one of the magical things about this place. 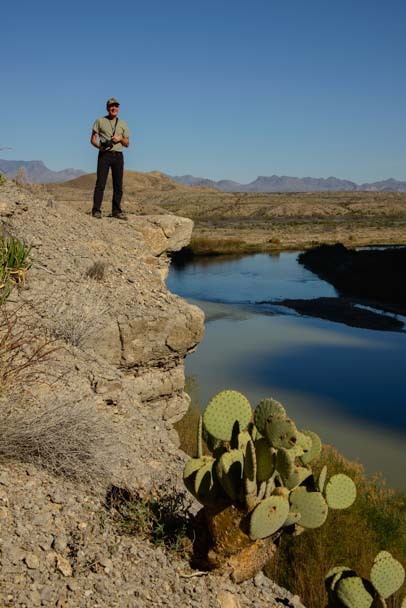 There’s the Rio Grande river that snakes along the south end of the park, the Chisos Mountains that tower at great heights in the middle, and the desert lands in between. 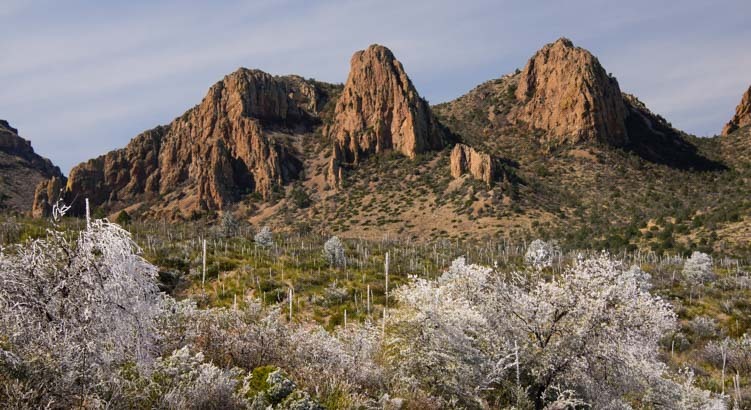 The Sierra del Carmen mountains at the far eastern edge of the park form a dramatic landmark that is easily visible from 21 miles away in the center of the park. These mountains sport horizontal stripes, and they turn gorgeous shades of pink at sunset. They also mark the location of Boquillas, the tiny Mexican village that sits on the other side of the Rio Grande. The imposing Sierra del Carmen mountains can easily be seen from miles away. 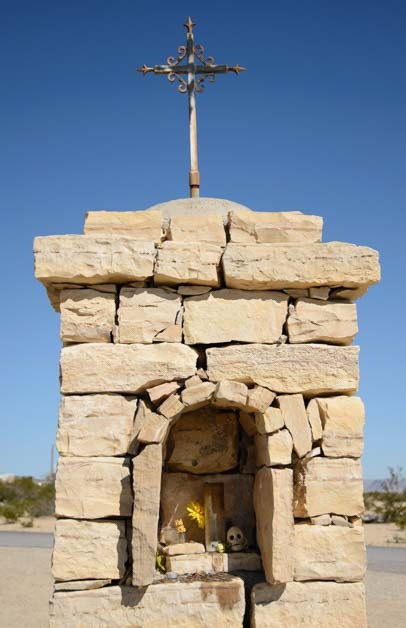 These are at the east end of the park by Rio Grande Village and the Mexican town of Boquillas. One of the loveliest drives is the Ross Maxwell Scenic drive that goes from the center of the park to the southwest corner. This drive winds up and down through craggy mountains that made us feel like we were back in Arizona. In the late afternoon, on our return, the mountains lit up bright orange. We were there in late February, and spring was already in the air. The Texas state flower is the lovely bluebonnet, and they were in full bloom everywhere. They love the roadsides, and all over the park we passed areas that were blanketed with them. Spring arrives in February, heralded by abundant bluebonnet flowers. 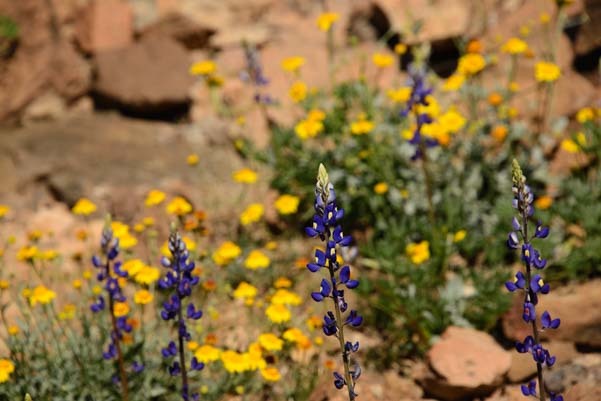 When we rounded one corner, we found a natural rock garden that was littered with a wonderful combination of bluebonnets and yellow flowers that looked absolutly vibrant against the jagged rocks. bluebonnet rock garden planted by Mother Nature. 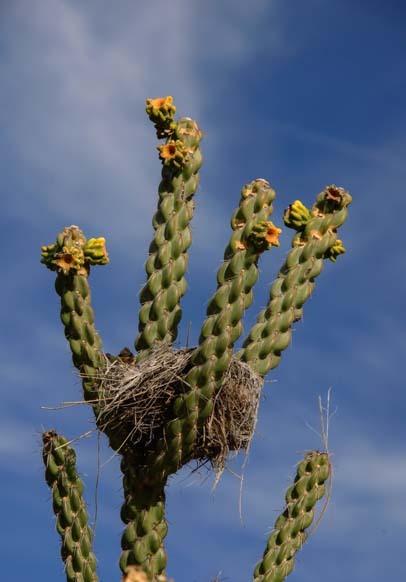 Birds sang in the trees, and we even saw a bird’s nest in a cactus. This seemed like a precarious place to put a home, but I guess it works! 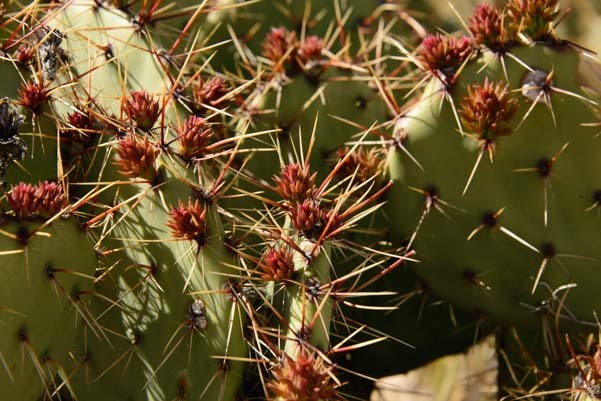 Cactus of all types are prolific in Big Bend National Park, especially prickly pear cactus. We saw many varieties. Some have no thorns, and some have very long sharp ones. This little guy kept an eye on me. Not far away was a well protected nest. Prickly pear LOVE Big Bend and come in many varieties. 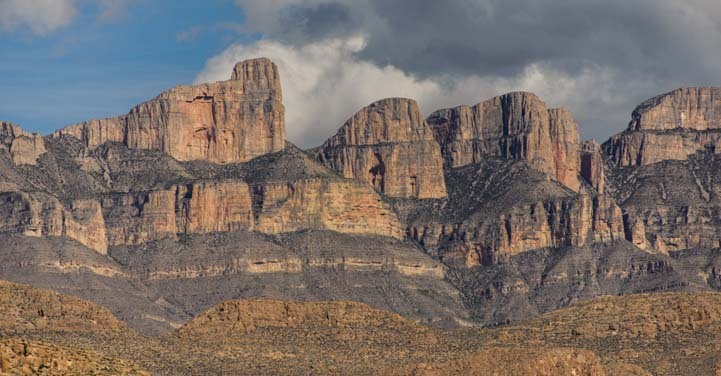 Big Bend can deliver all kinds of crazy weather, and we saw it all during our two week stay. When we first arrived the temps were warm and the air was dry and clear. It was perfect. But Texas is one of those places where if you don’t like the weather (or even if you do! ), just wait a minute, and it will change. 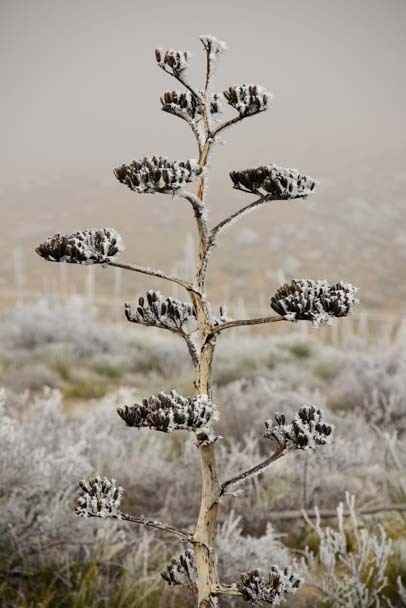 All of a sudden one night the temps plummeted into the 20’s, and we woke up to a winter wonderland of ice covering all the desert plants. 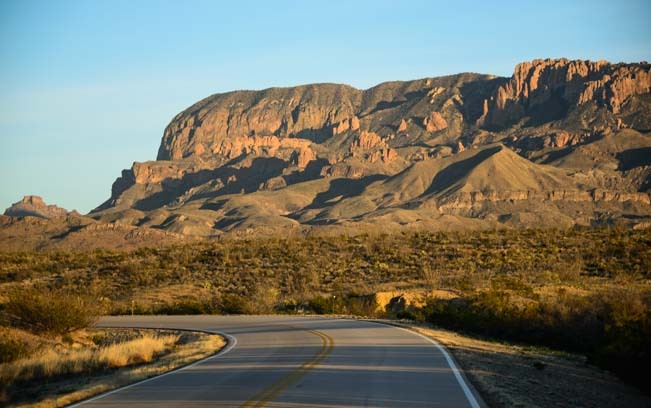 If the scenic drive up to the Chisos Mountains was pretty before, now it was absolutely stunning. 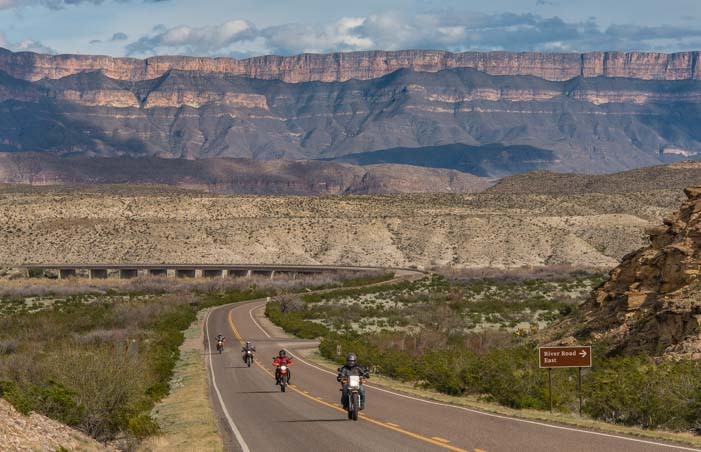 Texas can deliver some crazy weather, and Big Bend is no exception. The ice on the century plants was very cool. 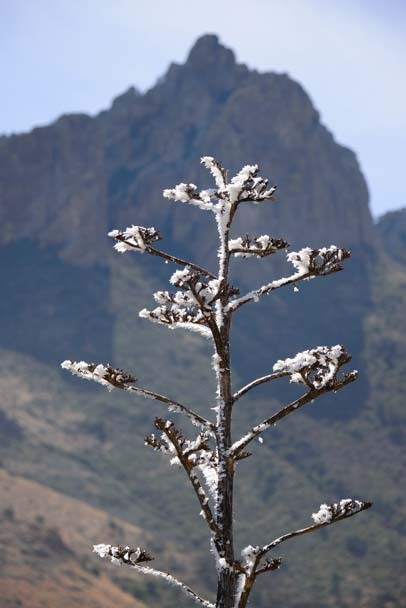 The drive into the Chisos Mountains was even more thrilling with all the lower elevation plants laced in ice. Luckily, this round of ice melted quickly and we were able to enjoy a few hikes which I’ll cover in the next post!